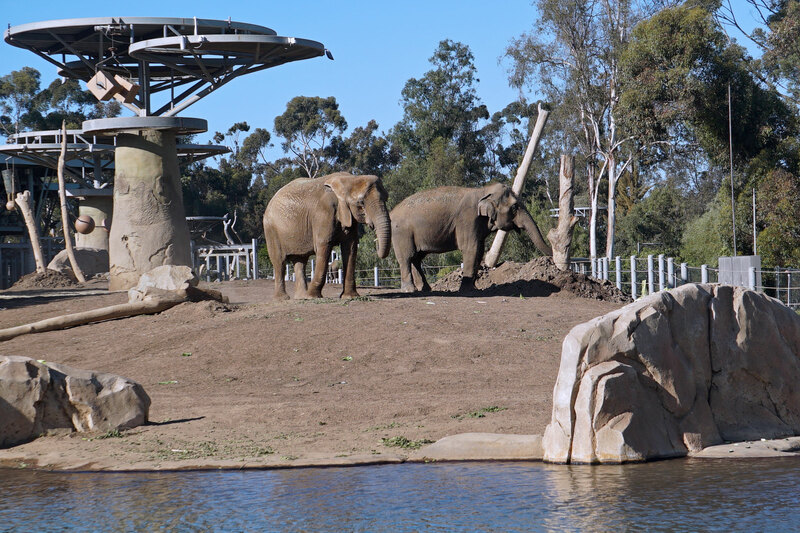 This is an updated, more in depth tour of the Elephant Odyssey area at the San Diego Zoo. 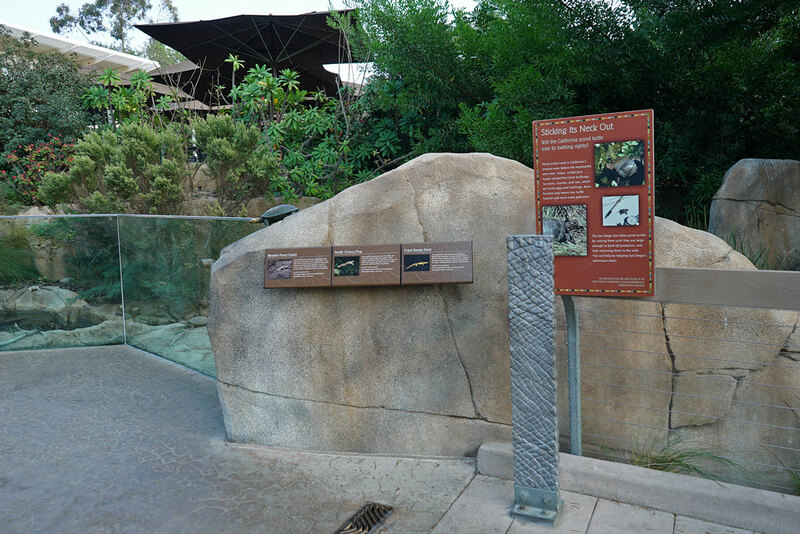 This section opened on May 23, 2009 and features a 2.5 acre elephant habitat. 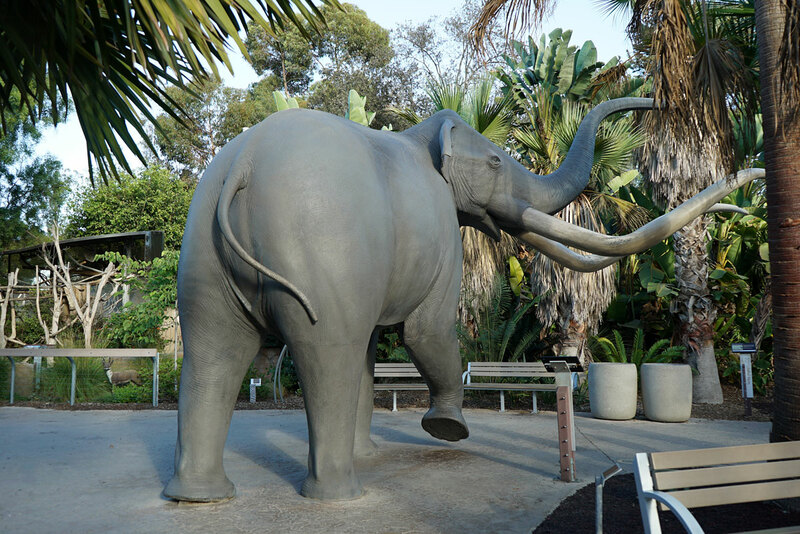 Elephant Odyssey also features sculptures of prehistoric animals from Southern California's ancient past alongside its present day counterparts including lions, jaguars, tapirs, guanacos, cabybaras, camels, and California condors. 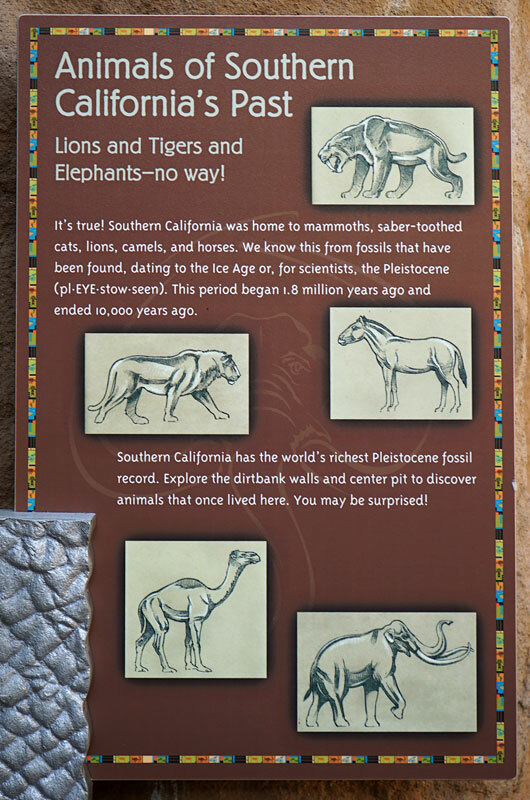 The Elephant Odyssey section is based on the animals from Southern California's past. 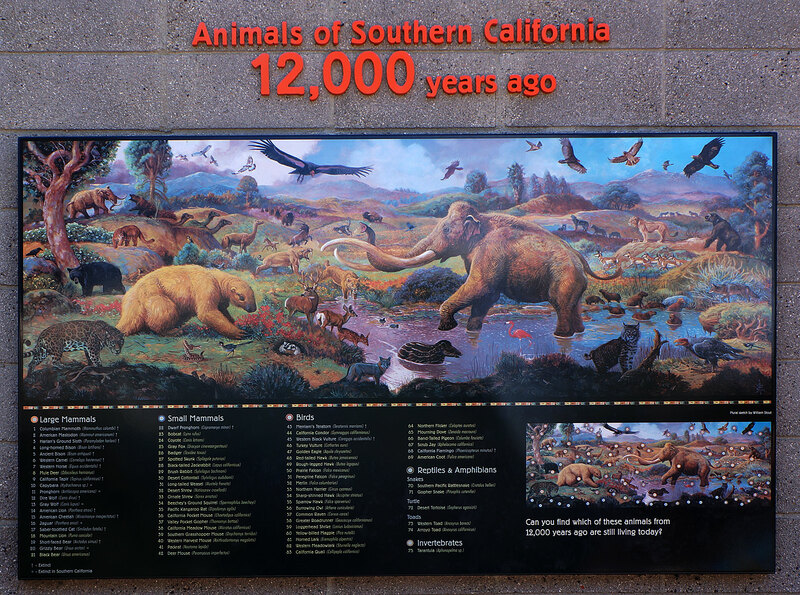 This sign depicts the area as it was 12,000 years ago. This sign depicts the animals of today. The most recent addition is not inside the area, but one that takes you to it. 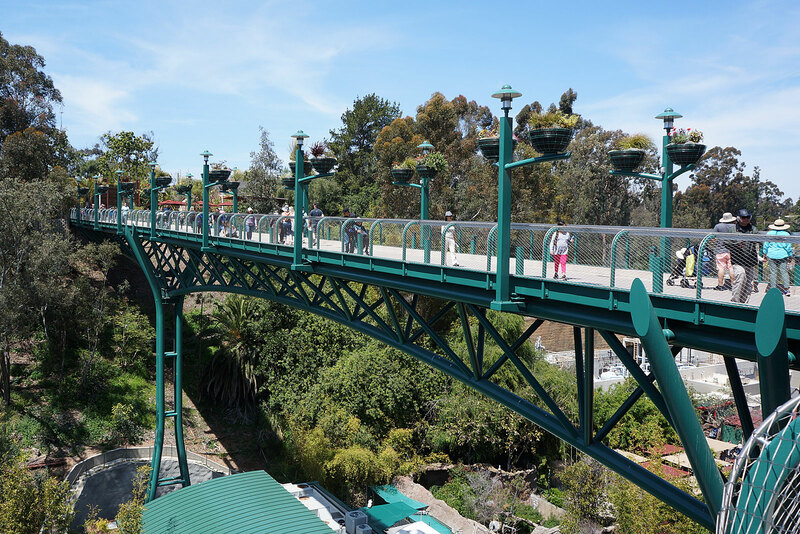 Opened in 2017, the new 70 foot high, 450 foot long Basher Bridge spans one of the zoo's many canyon's, providing a more convenient, and breathtaking, way to get to the Elephant Odyssey. 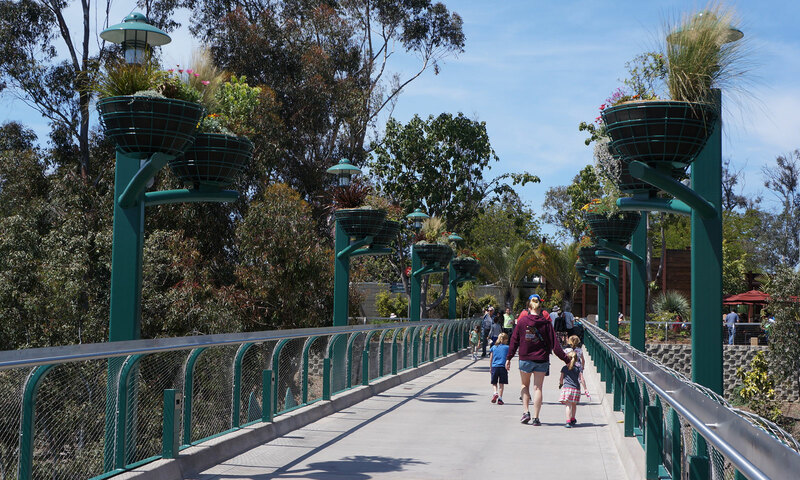 It was dedicated to Army veteran Jim Bashor and his wife, who established the Bashor Family Patriots Fund—an endowment that permanently guarantees that active duty armed forces personnel are granted unlimited admission to both the San Diego Zoo and the San Diego Zoo Safari Park. 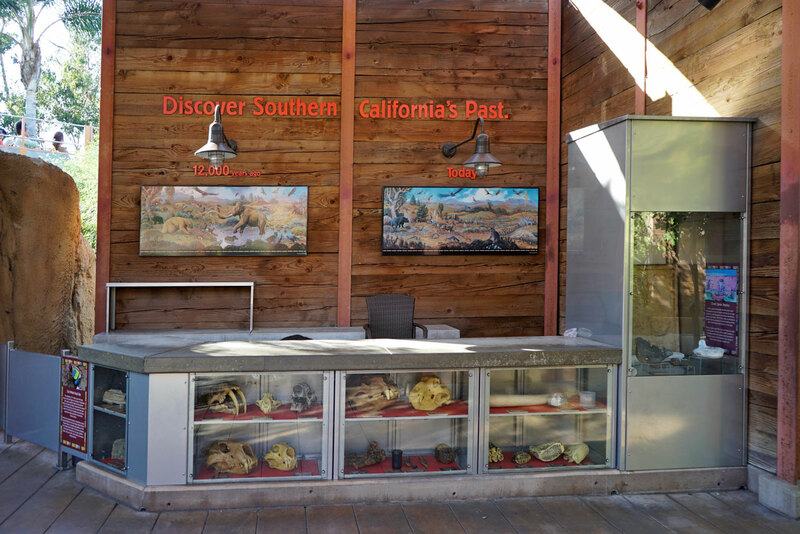 While the Bashor Bridge takes guest to the west entrance of Elephant Odyssey, we're going to start at the east entrance, in which guests are greeted by the area's first exhibit, the California Condor. 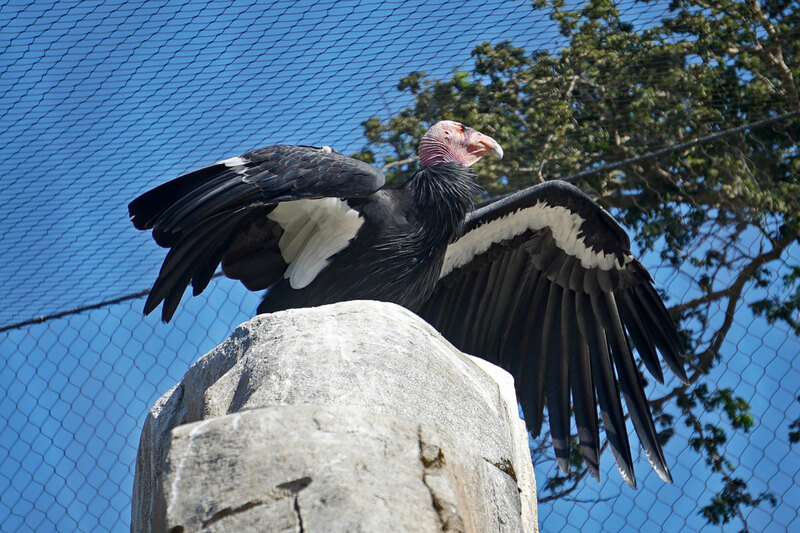 The California Condor was on the brink of extinction in 1980s when there were only 22 known living birds in the wild. 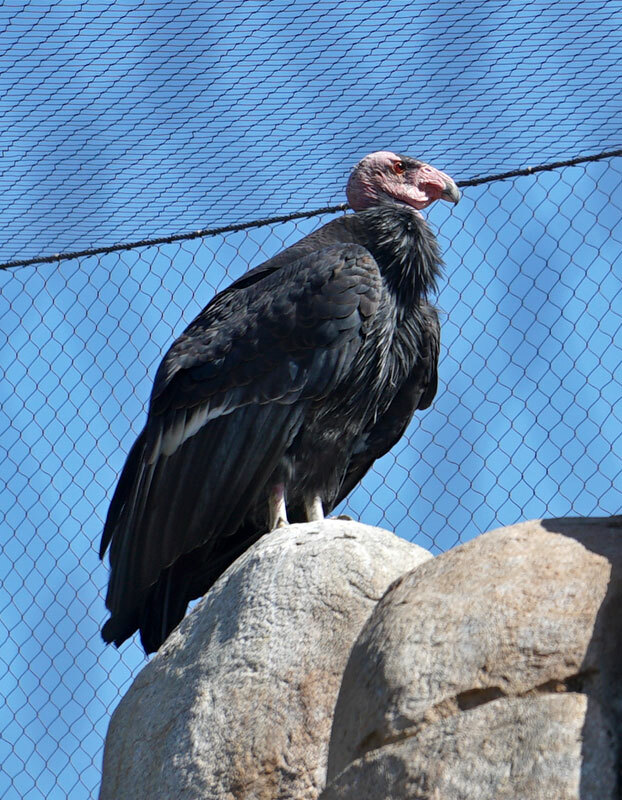 Led by the San Diego Zoo and the Safari Park's breeding program, the world's population of the condors has grown to over 400. They are still endangered, but their future is looking very positive today. 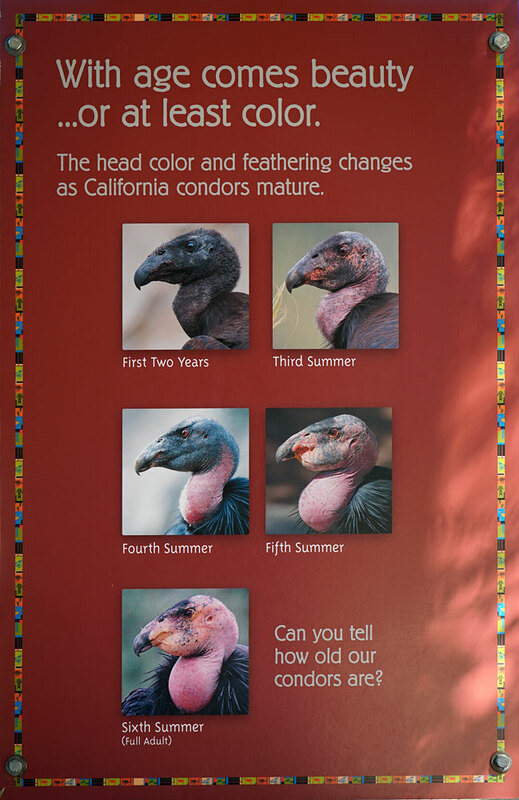 There are two condors on display here. 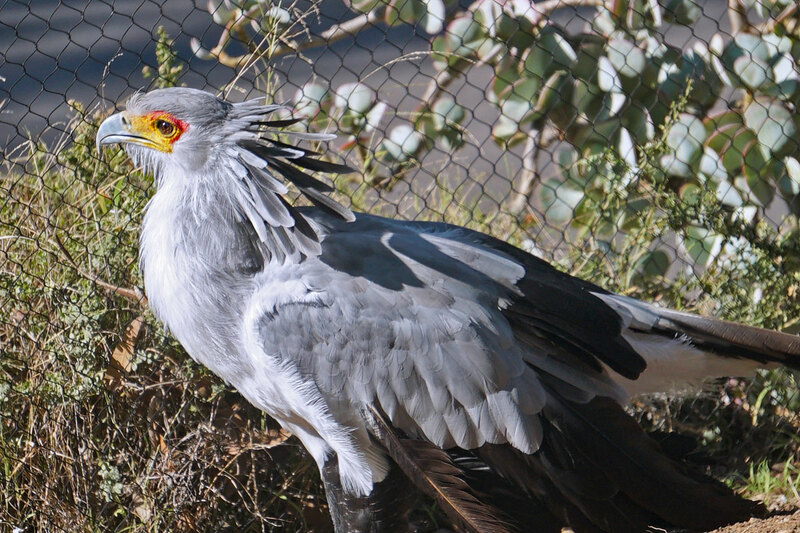 They are members of the vulture family. 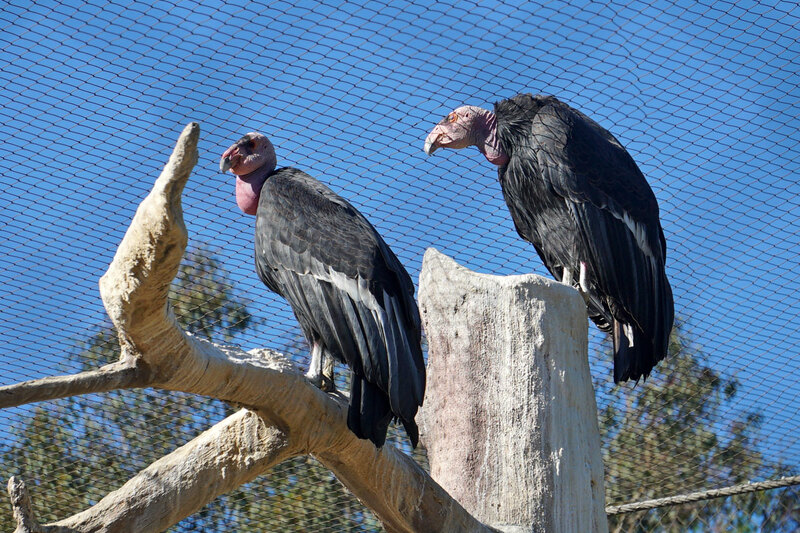 Their heads are bald due to the fact that, like all vultures, they feed mostly on carrion, and it is easier for them to keep their heads clean. 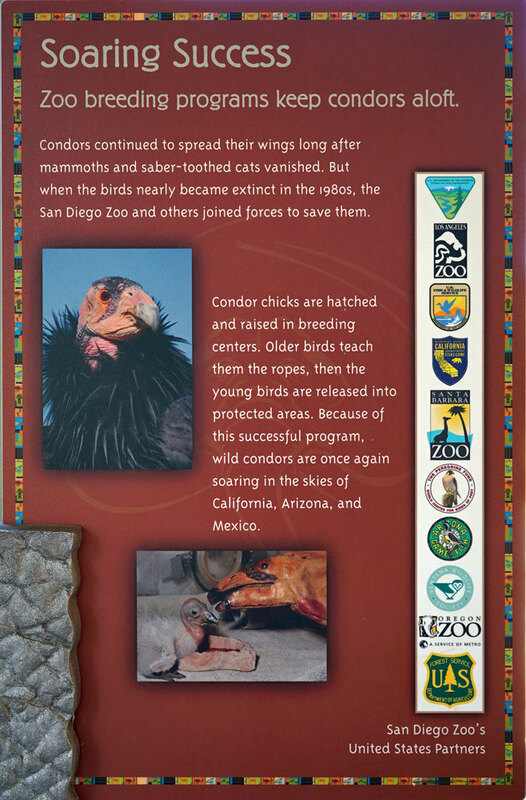 This sign explains a little about the zoo's condor breeding program. There are other informative signs throughout the exhibit. 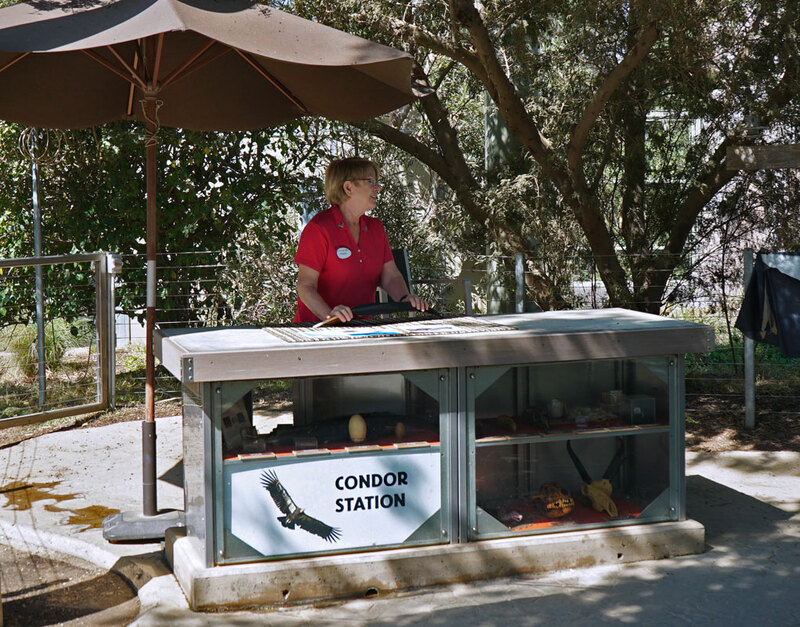 One of the zoo's many volunteers is on hand to answer questions at the Condor Station. 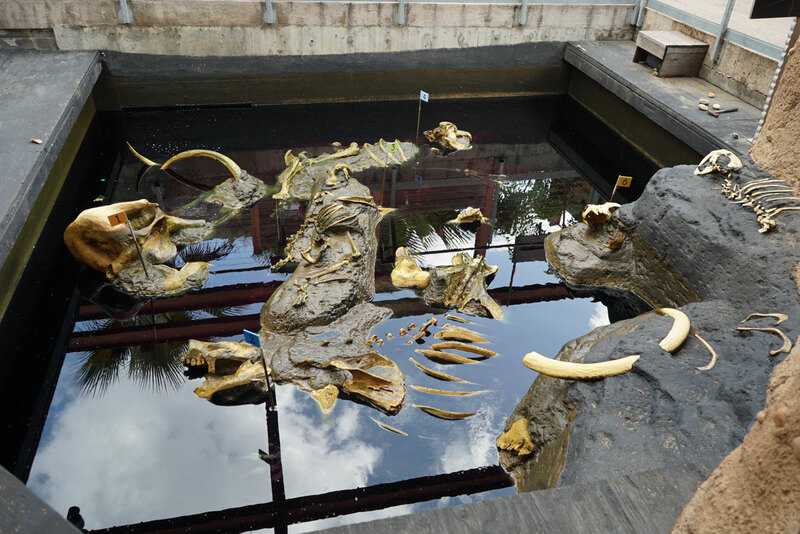 One of the area's many prehistoric sculptures is displayed nearby. 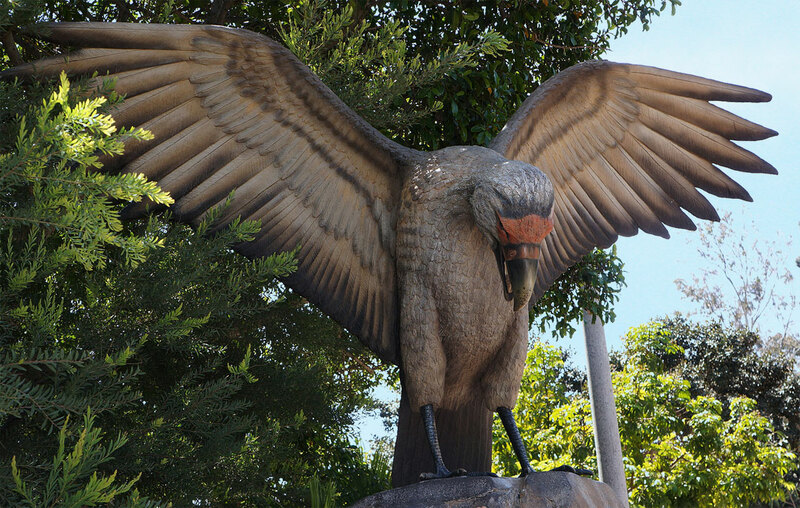 This is Merriam's Terator, an extinct bird of prey that weighed 30 pounds and had a wingspan of 10-12 feet. 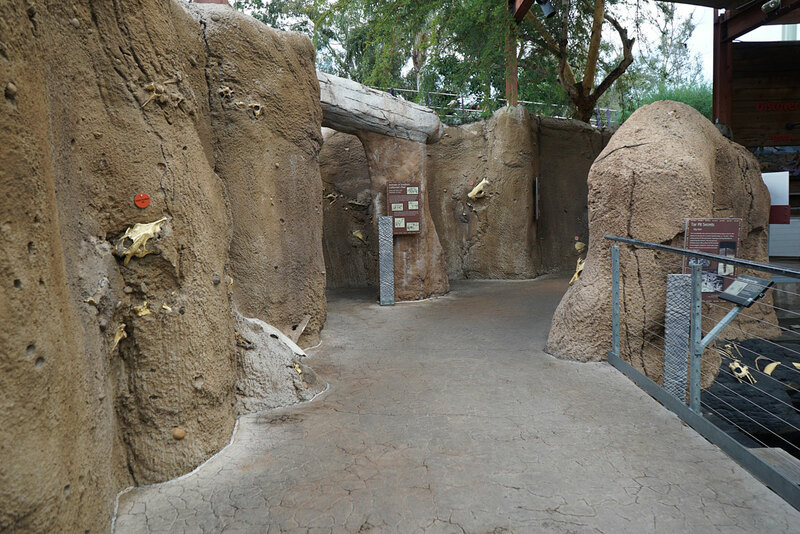 Sharing space with the Condor enclosure is the Rattlesnake Exhibit. There are two parts to the exhibit. 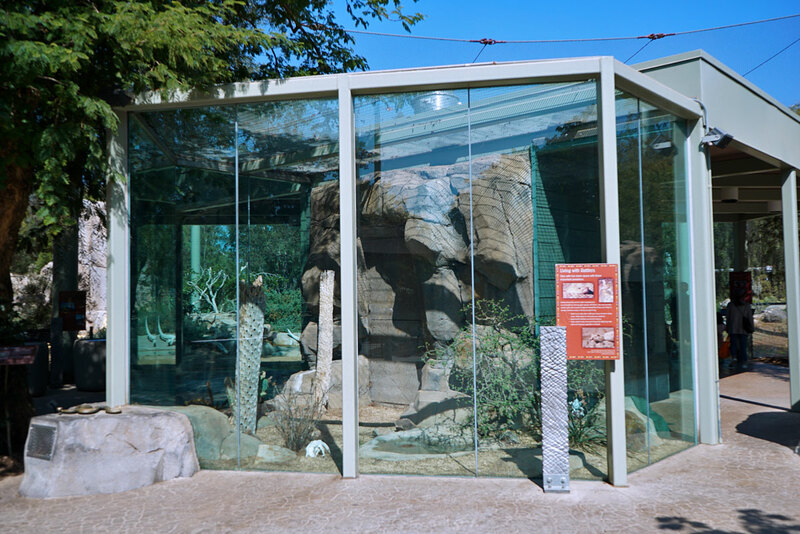 This tall, airy enclosure is where the snakes can bask in the sun and keep warm. 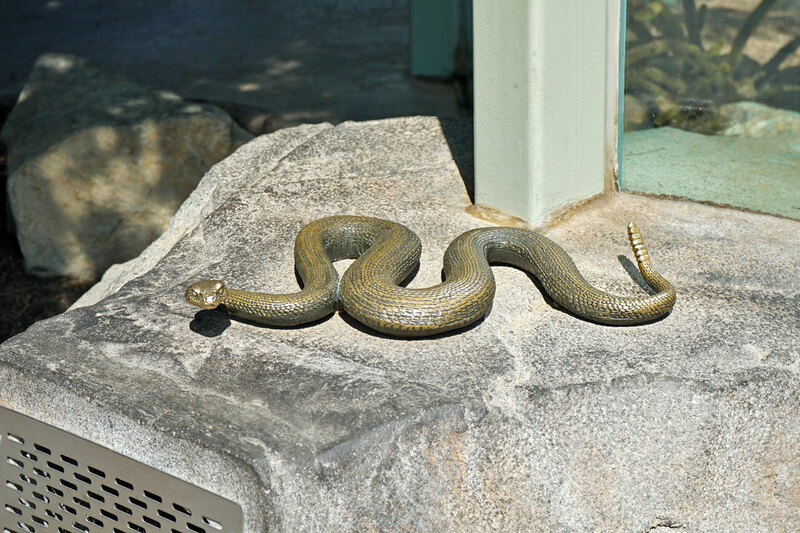 When the snakes need to cool down, they can go into a number of shaded burrows. This sign explains in more detail. Here, a pair of rattlers are keeping warm in the sun. 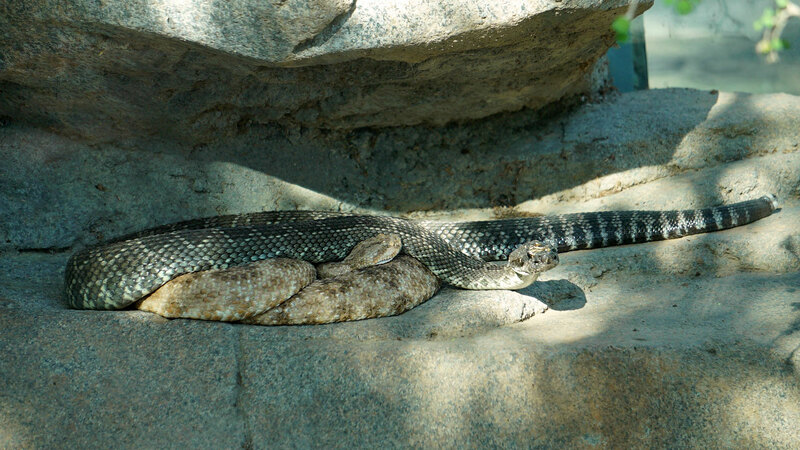 The snake on top is the Southern Pacific Rattlesnake. 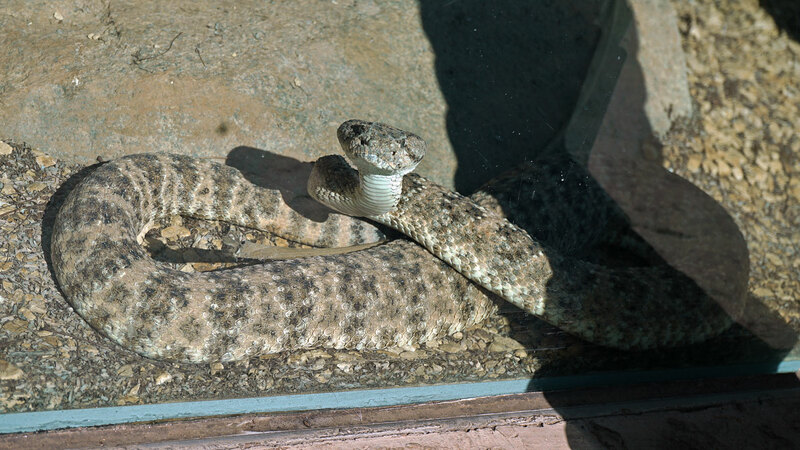 These rattlesnakes lived in the Pleistocene Era and are still with us today. 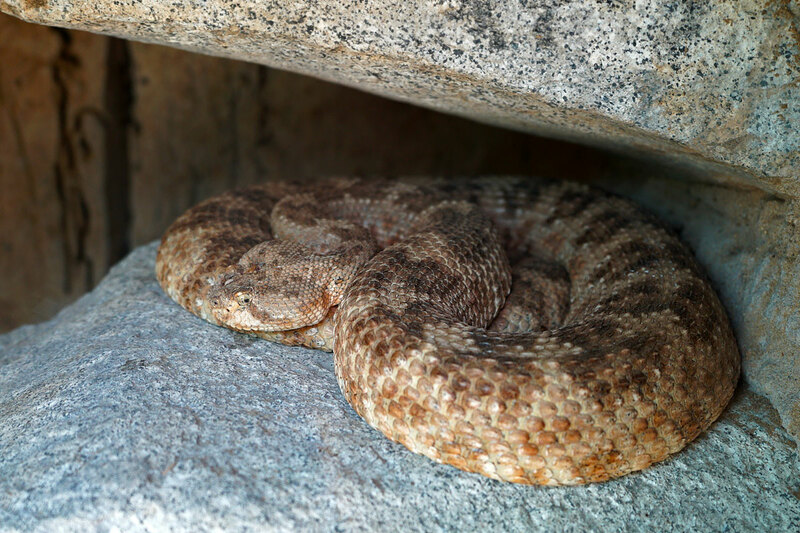 The Red Diamond Rattlesnake curled up in its burrow. 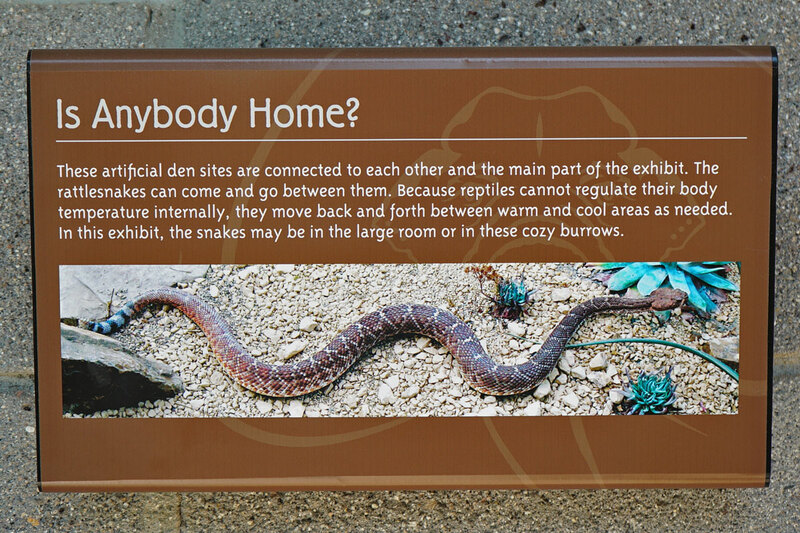 Outside the enclosure is this rattlesnake sculpture. The sound of its rattle can be heard from the speaker below. 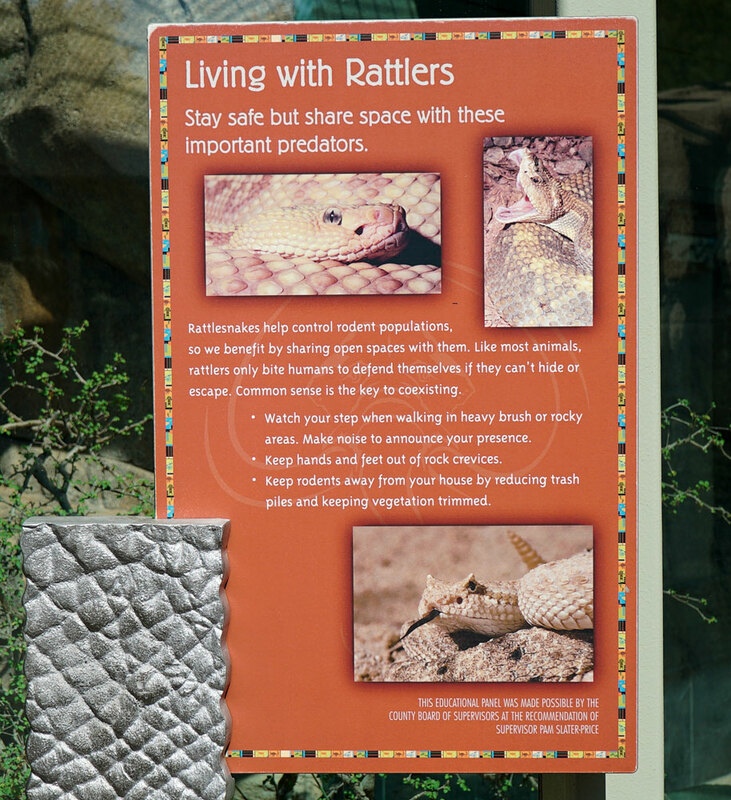 A few safety tips concerning rattlesnakes. 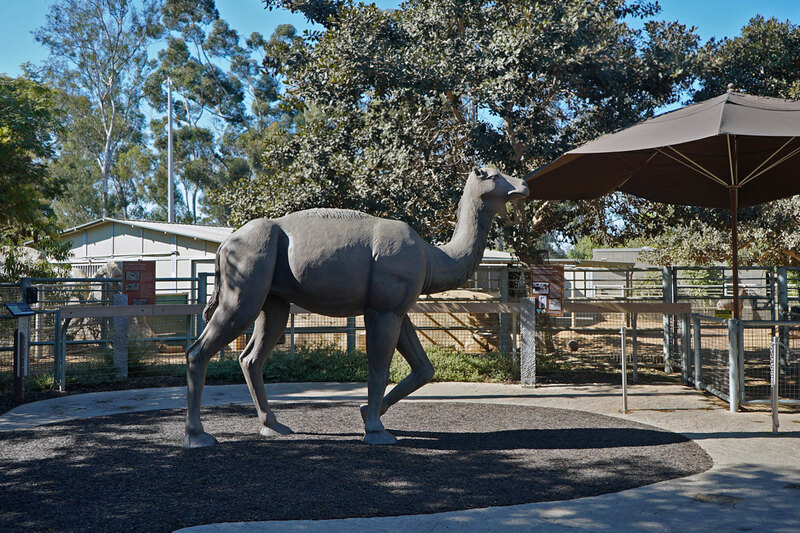 A sculpture of a prehistoric camel stands in front of the Horse and Burro Corral. 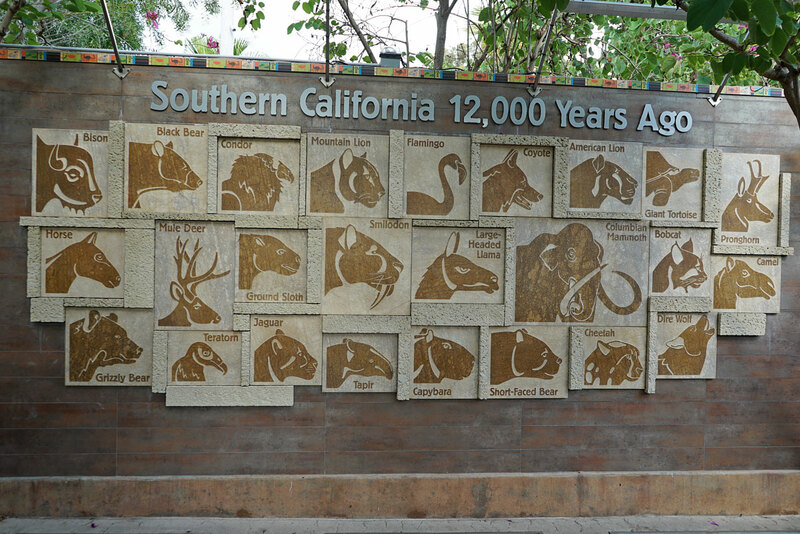 Horses actually became extinct in North America 10,000 years ago. 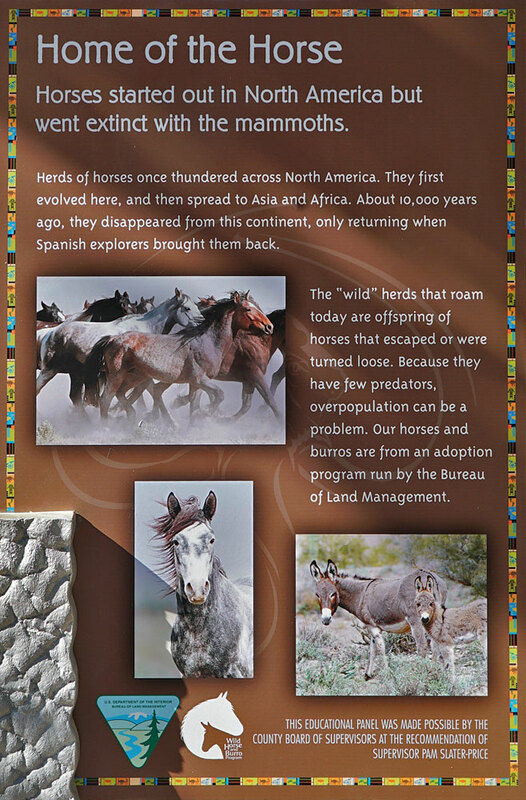 The wild horses of today are descendants of escaped domestic horses originally brought over from Asia and Africa. 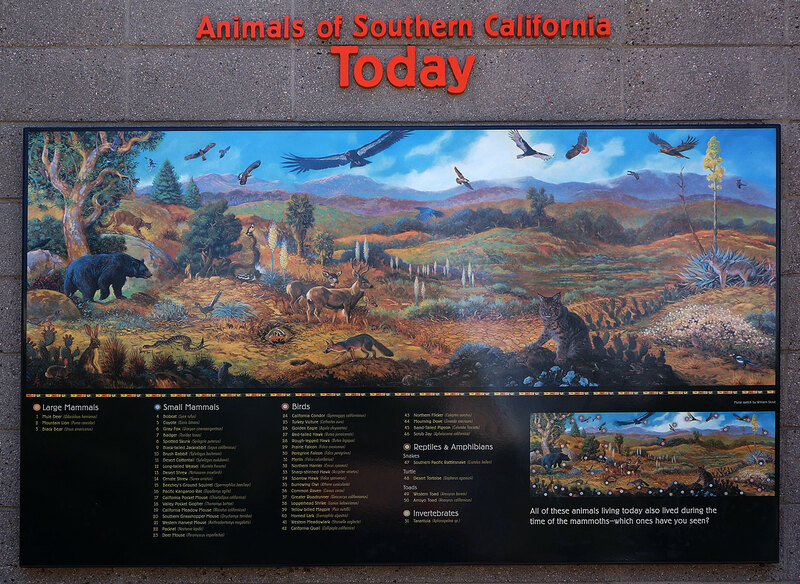 The animals housed here are from an adoption program run by the Bureau of Land Management. 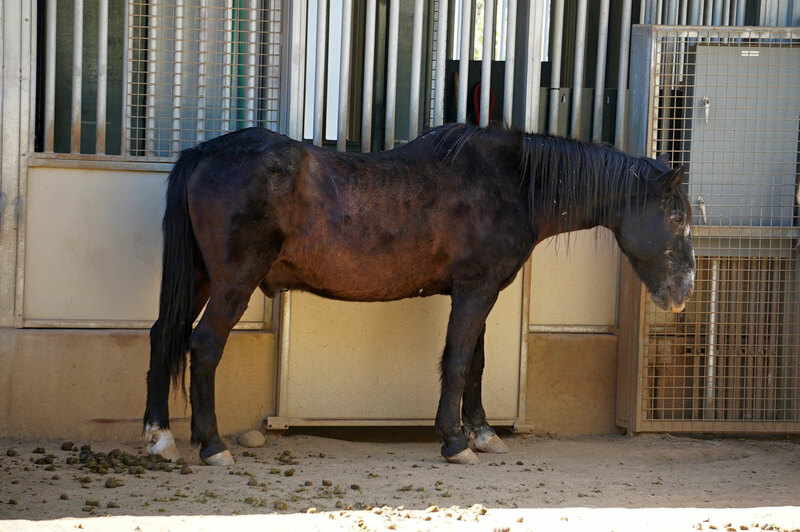 This old horse gets to live out his last years pampered by zoo employees, as opposed to the glue factory. 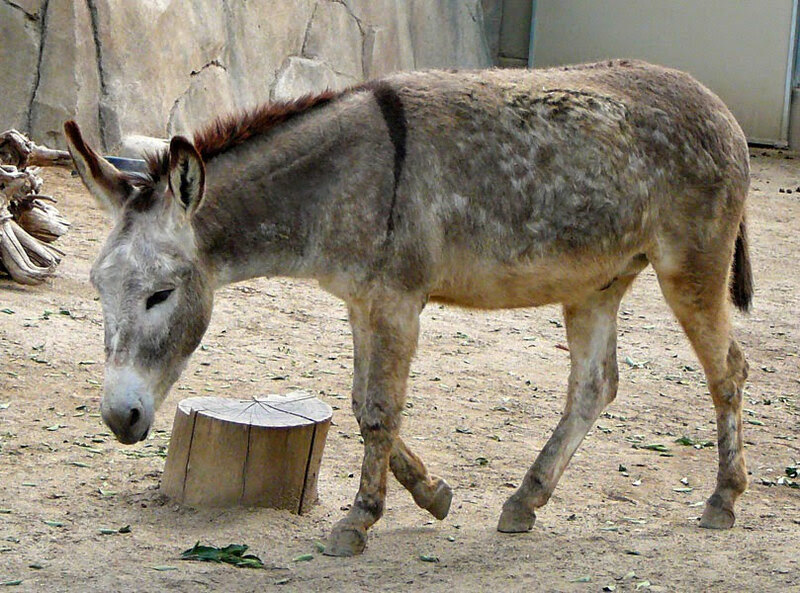 A pair of burros are also kept here in the corral. 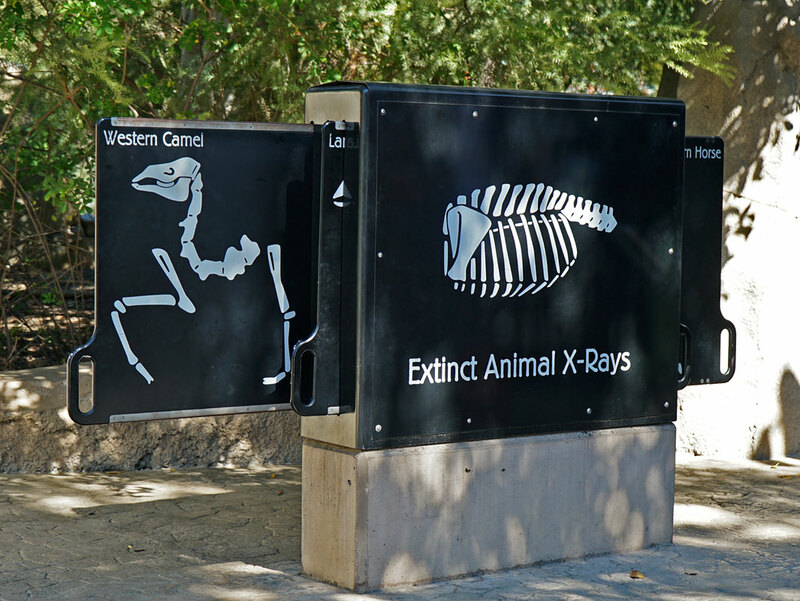 Nearby, guests can view a display of extinct animal x-rays. 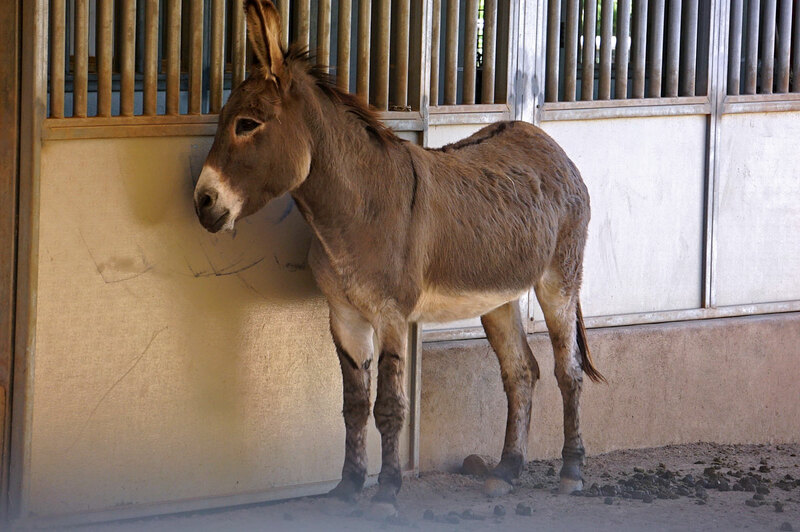 While it's nice for the horses and burros (being rescued/adopted), I would imagine that they don't get many visitors here. When I go to a zoo (it would be a day trip, and time would be limited), I would want to see the exotic and big-name animals. Horses and burros would not be at the top of my list. 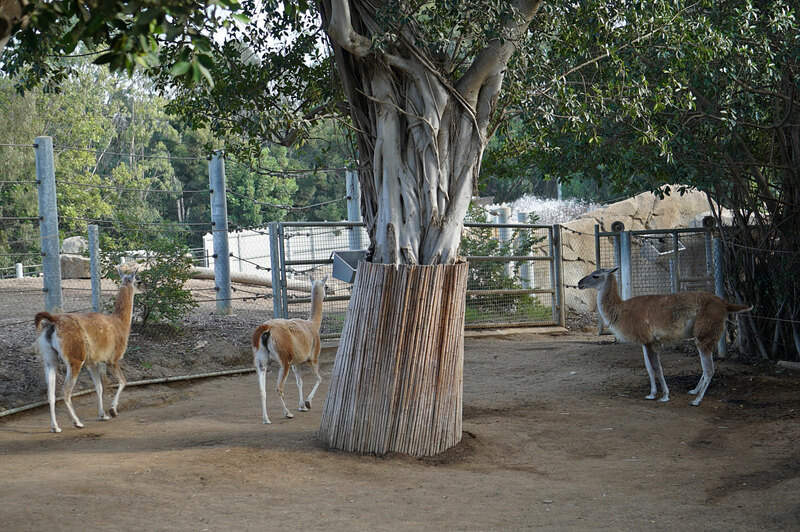 Now watch, yer gonna tell me that this is the most-visited part of the zoo. 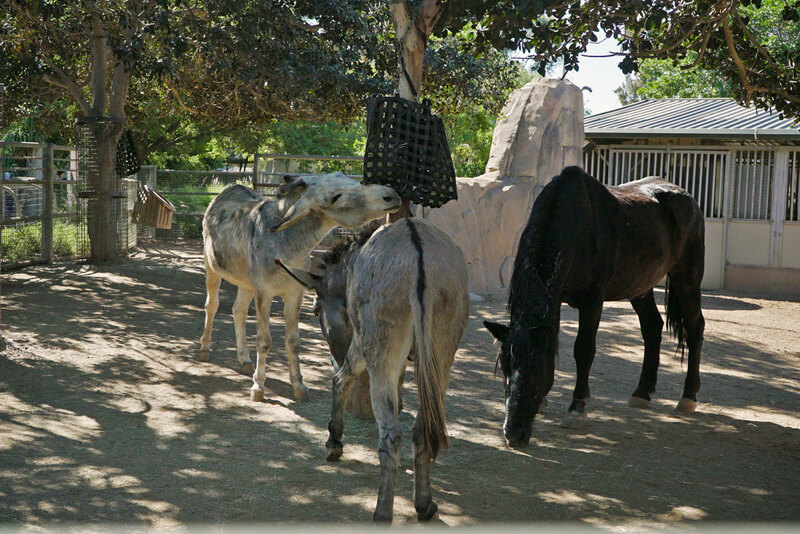 The corral was originally intended for the endangered, Prezalski's Horse, from Asia. I can't remember if, or how long, they were there. I believe they later had camels there for awhile, thus the prehistoric camel sculpture out front. My memory's a bit foggy on this. But somewhere along the line, they developed this relationship with the Bureau of Land Management to adopt the animals that now inhabit the corral. They do have a special "Keeper Talk" presentation at the corral once a day. But no, the crowds aren't flocking to see the burros. Animal exhibits change all the time. 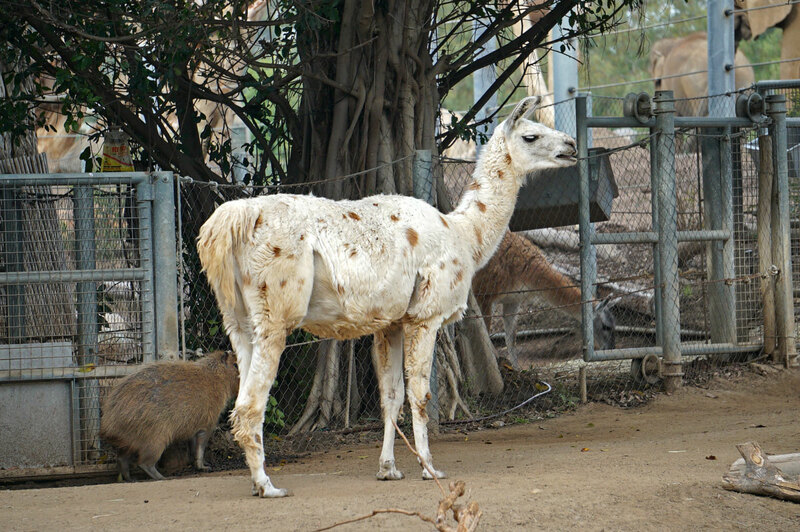 Some animals are only on loan to the zoo for a few years. And of course, animals die and can't be replaced. 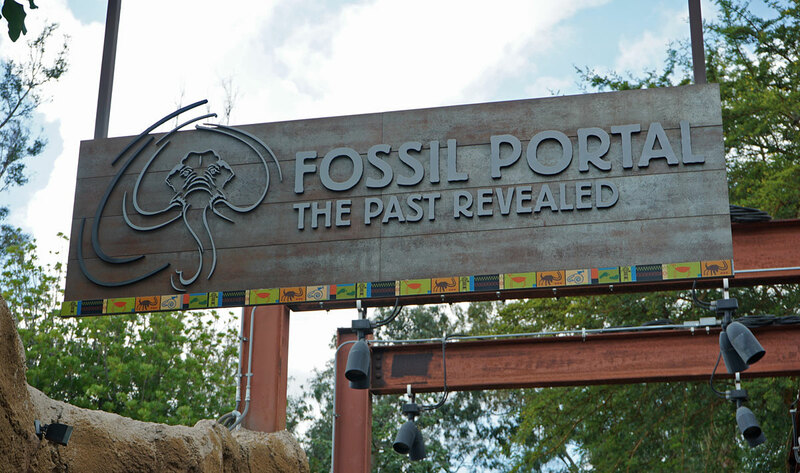 So, I expect the animals housed here could change in the future. As we continue our tour, we come upon the Dromedary Camels. 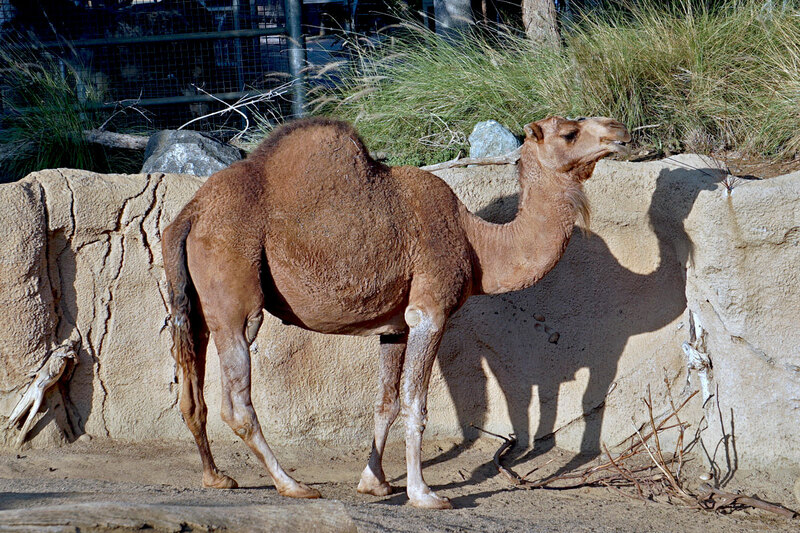 The Dromedary Camel can be found in Africa, Asia and Australia. 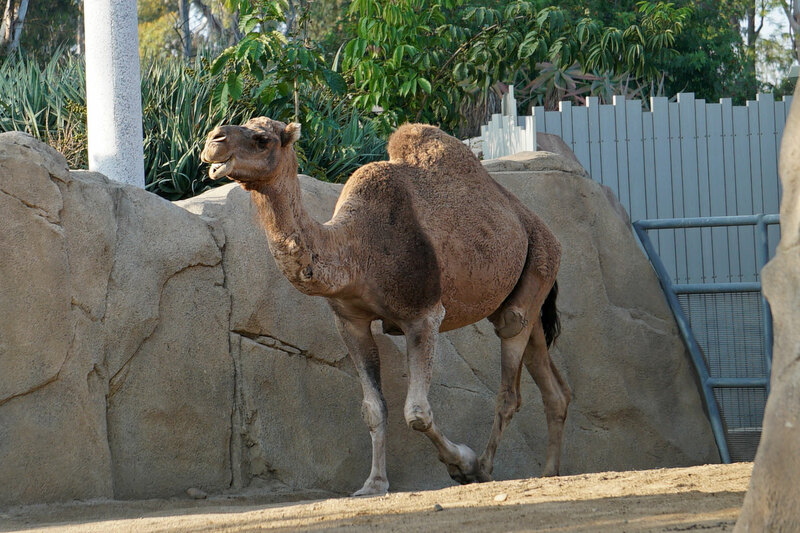 It has only one hump, unlike the Bactrian Camel, which has two. The humps contain fatty tissue (not water) which helps them survive in hot climates. 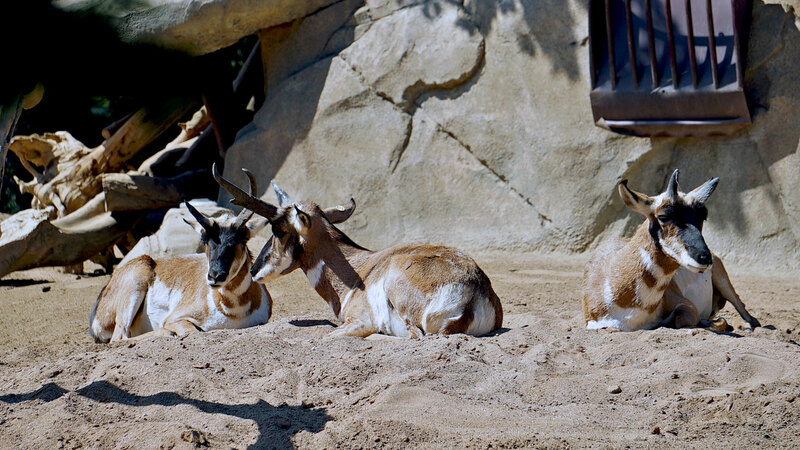 Sharing the enclosure with the camels is the Pronghorn antelope from North America. 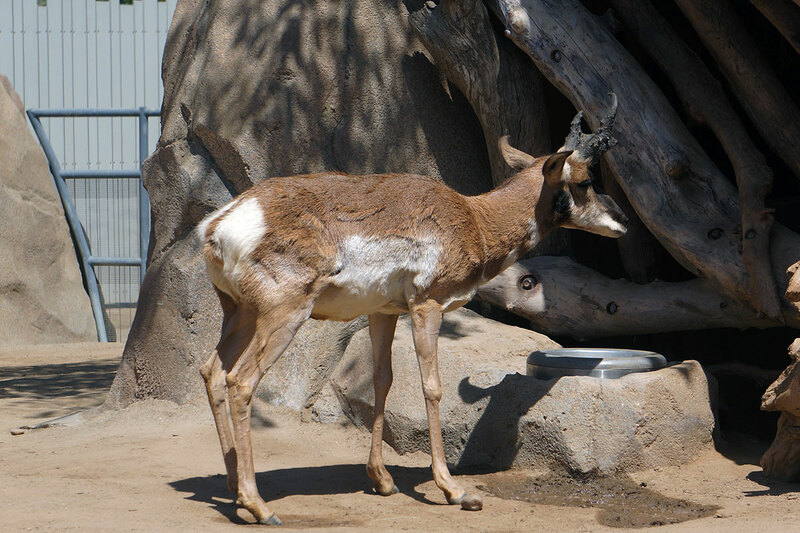 A bit a trivia...In the song, "Home on the Range", the antelope referred to are the Pronghorn. 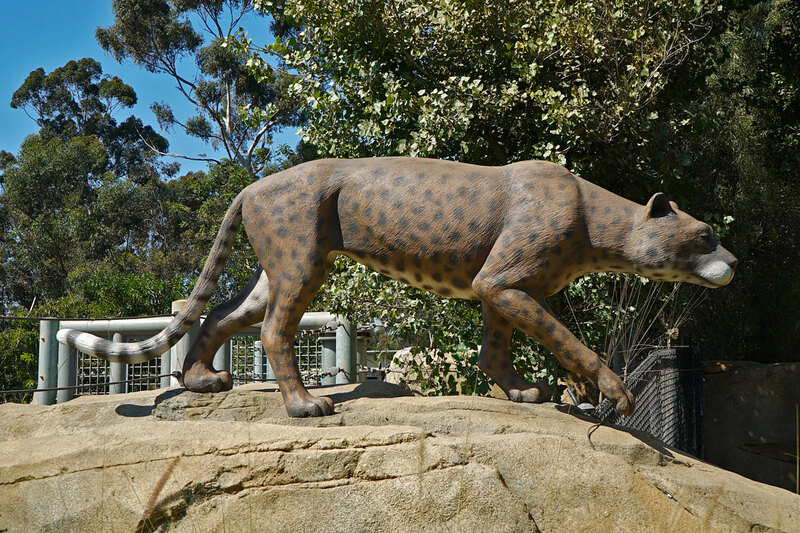 Standing nearby is a sculpture of the extinct American Cheetah. 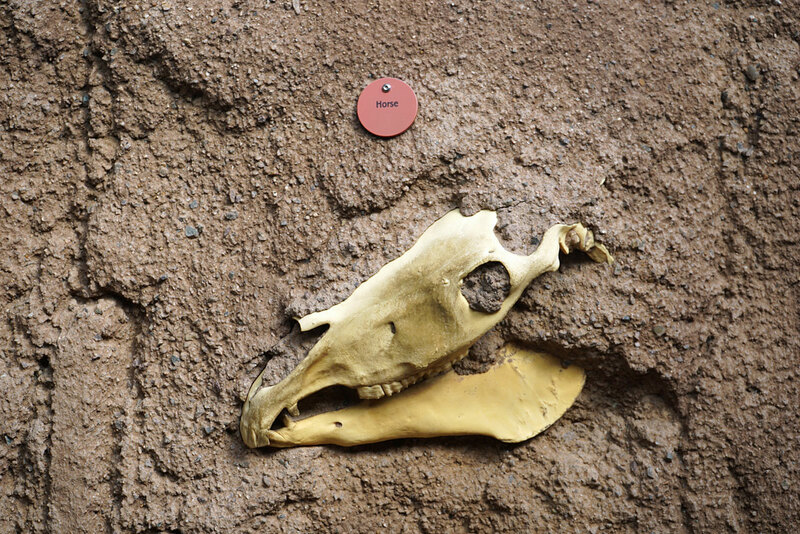 This animal once preyed upon antelope like the Pronghorn during the Pleistocene era. 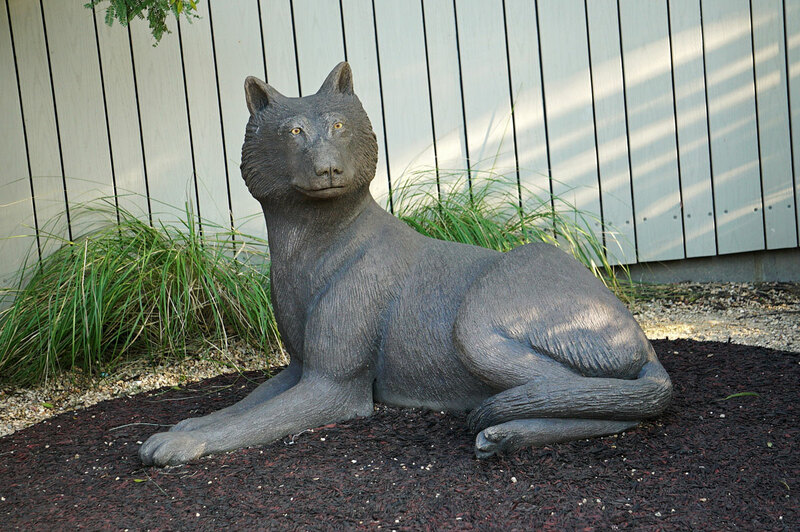 Another prehistoric predator was the Dire Wolf. 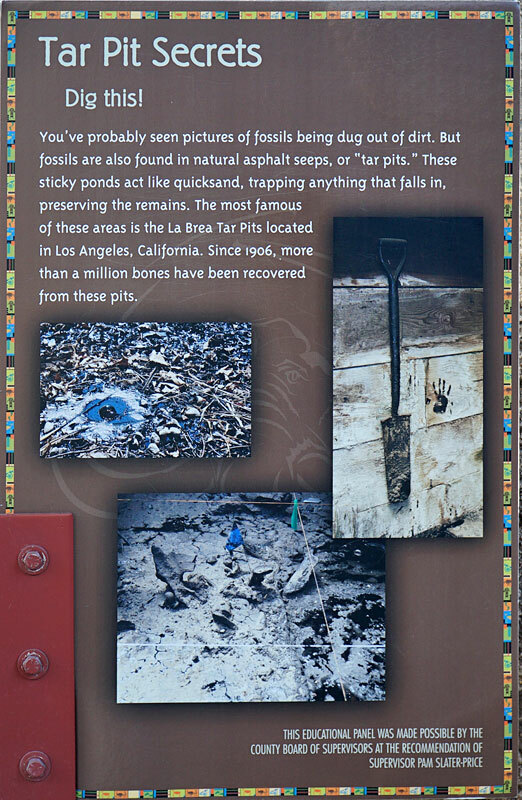 Nearly 4,000 Dire Wolves have been unearthed from the La Brea tar pits in Los Angeles. 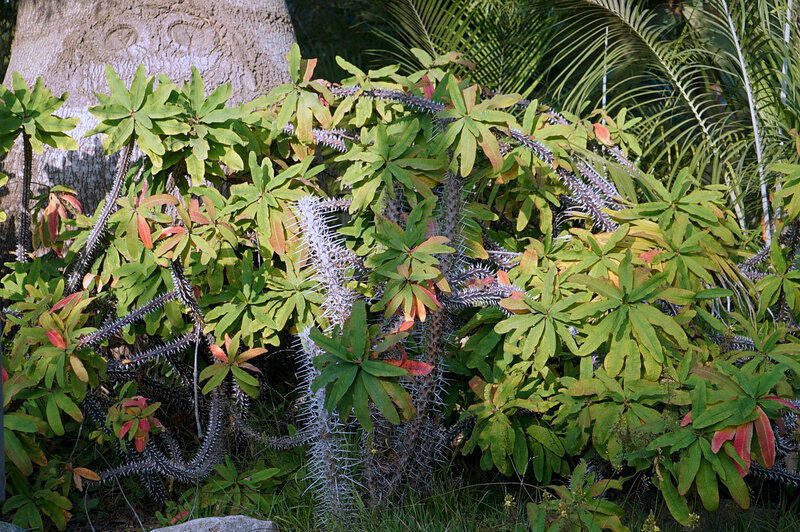 This garden of plants from Madagascar can be found across from the enclosure. 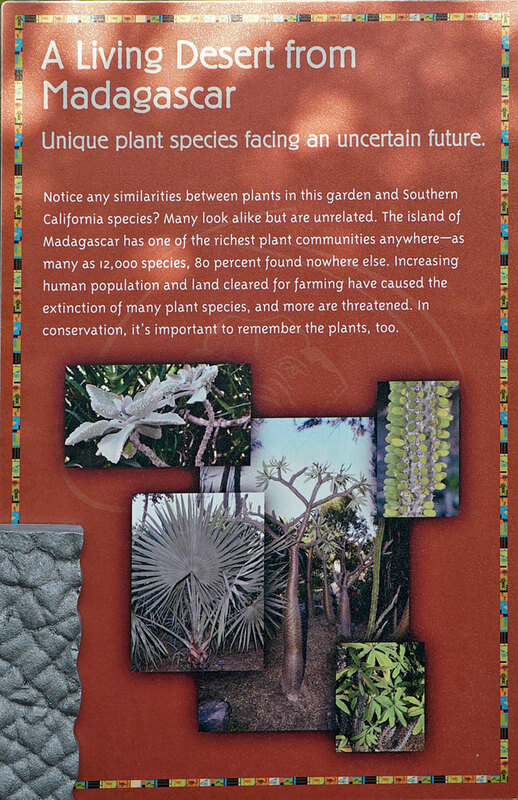 In the Living Desert sign, the tree in the largest image in the center definitely looks prehistoric. Probably a member of the Baobab family. 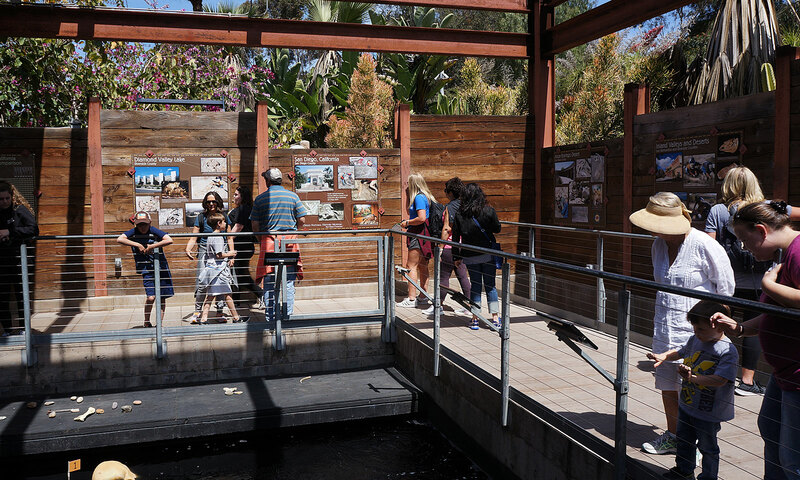 Along the walkway below the Sabertooth Grill, is an exhibit featuring a man-made stream, filled with small reptiles and amphibians. At least, that's what the signs say. 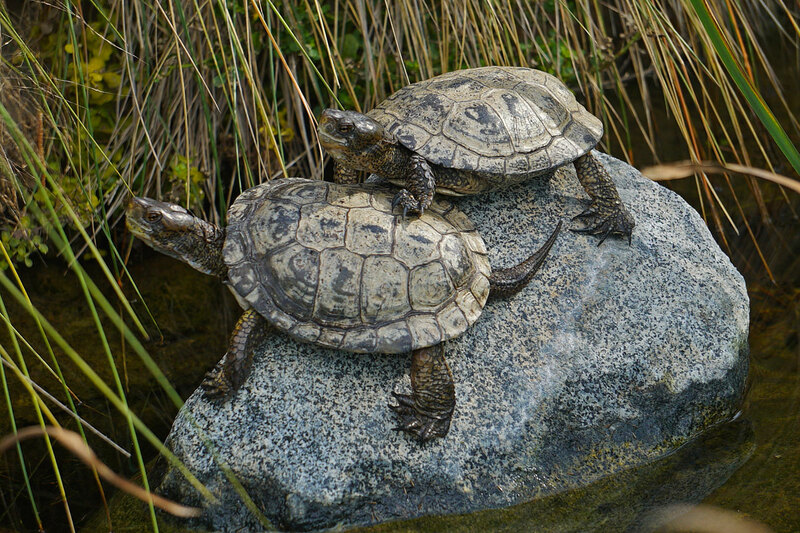 To this day, I've never seen anything but some pond turtles. 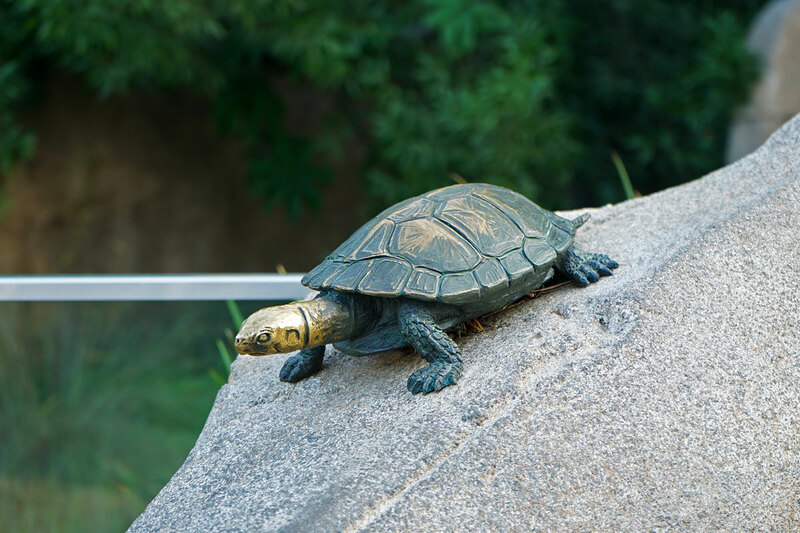 There are quite a few sculptures sprinkled around the rocks, which many guests first mistake for the real thing. 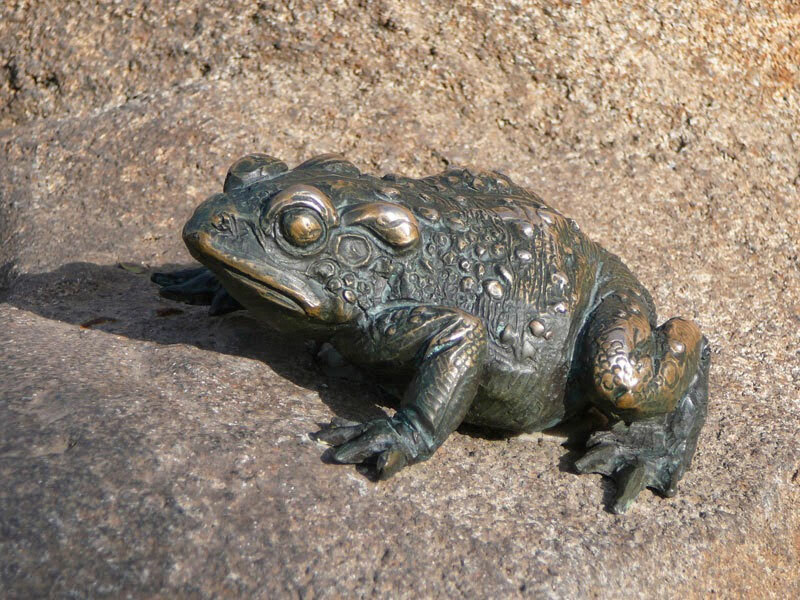 This frog sculpture is the only frog I've found in the exhibit. Maybe the real ones jumped out. 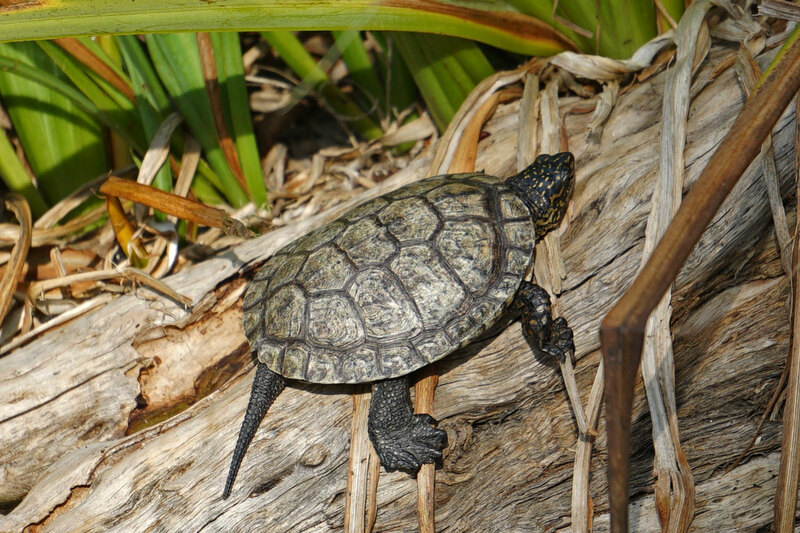 There are plenty Pacific Pond Turtles to be found though. 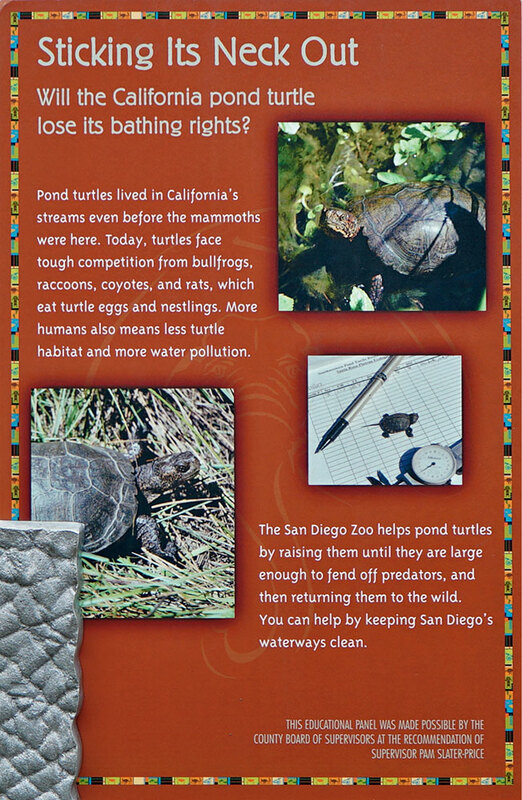 This sign tells how the San Diego Zoo is helping this common, California native turtle keep from becoming endangered, just like it does for so many other more exotic animals in the world. 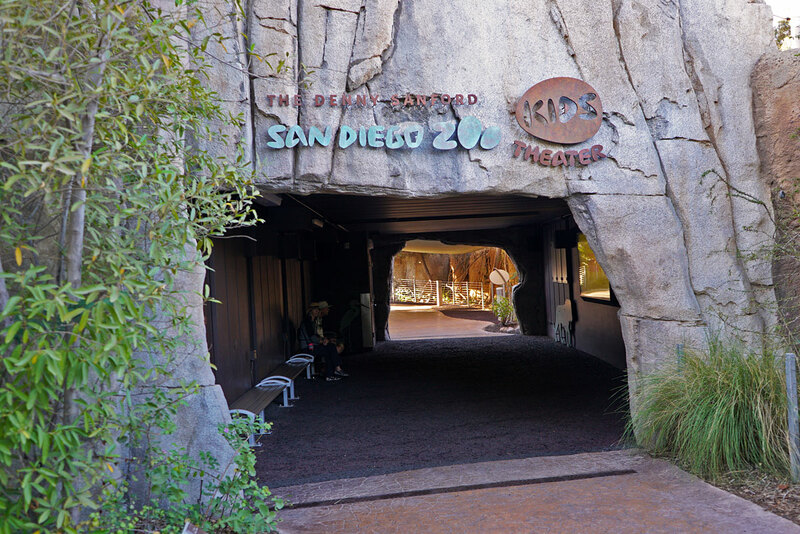 The San Diego Zoo Kids Theater is a small theater built into a cave, that shows short films on various animals continuously throughout the day. You actually have to walk through the theater to continue to the other side of Elephant Odyssey. 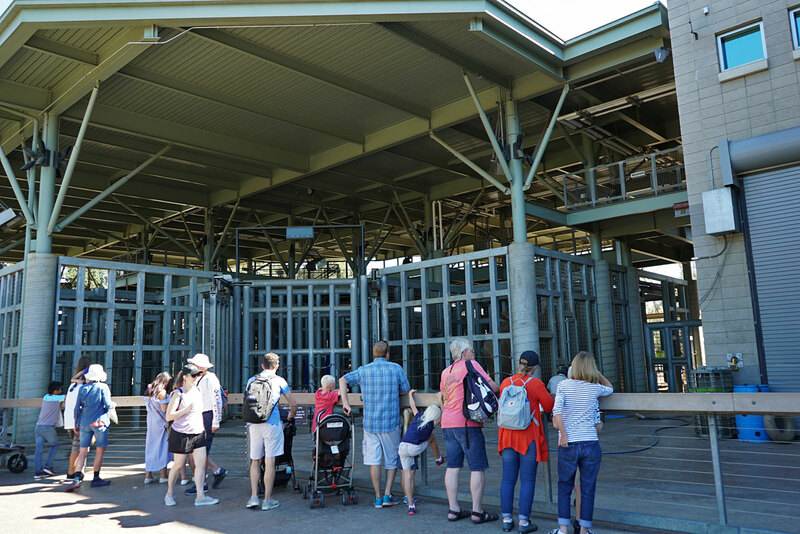 In actuality, the theater is a bridge between two very large elephant enclosures, which allows the elephants to move from one to the other. So while watching one of the short films, elephants could actually be crossing above your head. Meerkats are the focus of this presentation. 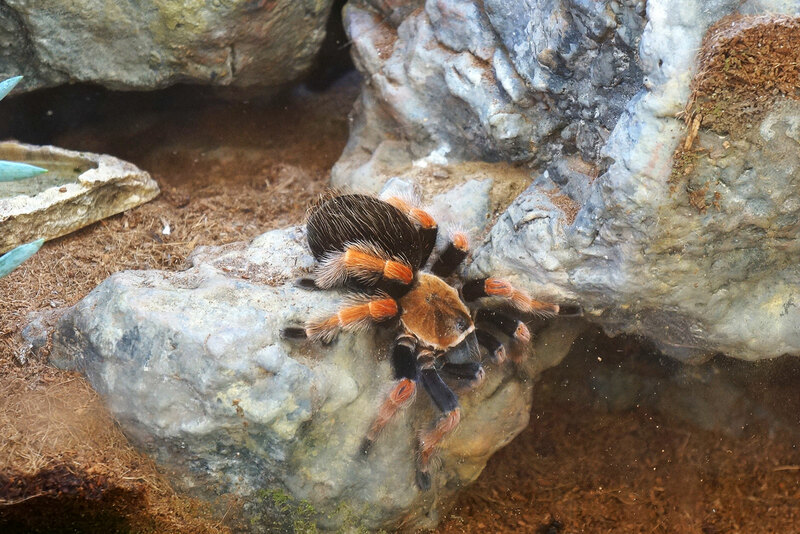 Right outside the theater are a number of small terrariums housing some very creepy insects, like this Mexican Fireleg Tarantula. 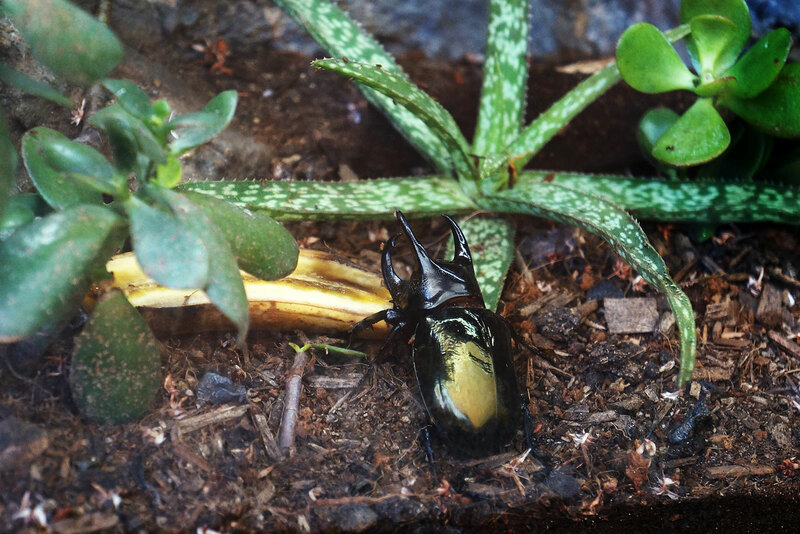 The Rhinocerous Beetle, found on every continent except Antarctica. 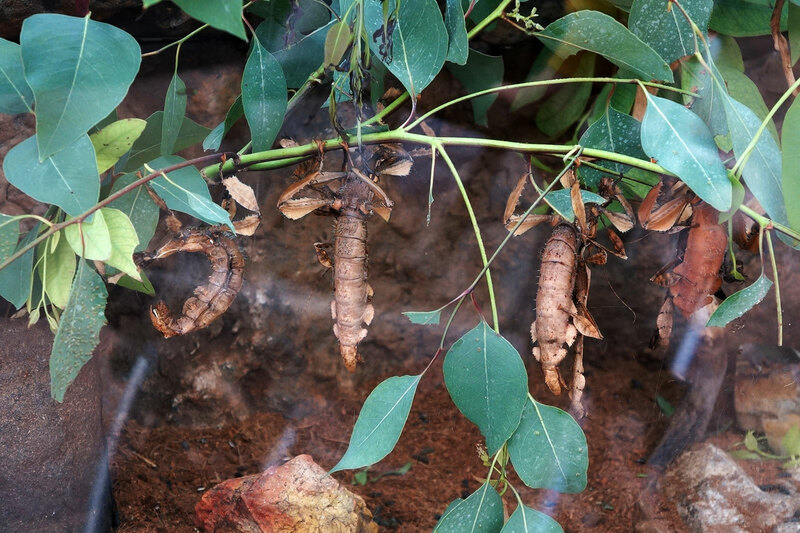 The Spiny Stick Insect, found in Australia and New Guinea. I like how they turned what would be an otherwise ordinary passageway, into a fun and useful space for kids. I also like the idea of elephants walking above my head. 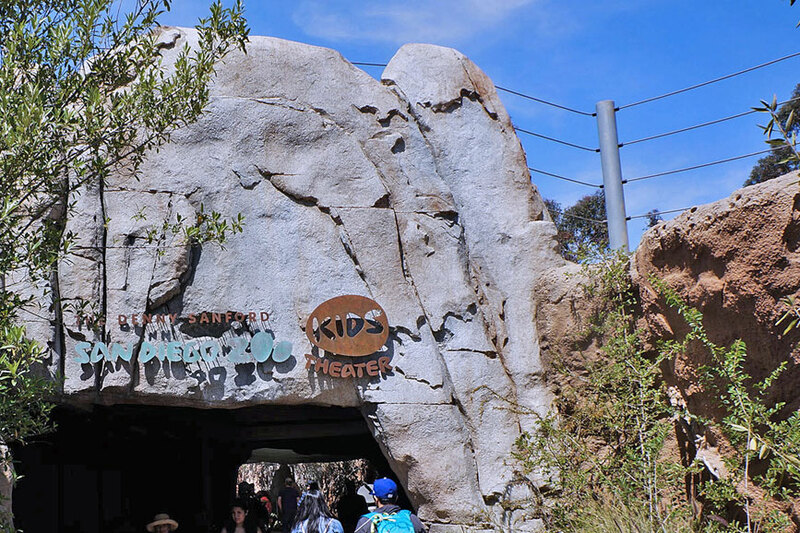 The cave entrance theming is a nice touch. Brookfield Zoo outside Chicago has something similar, but for Bison. 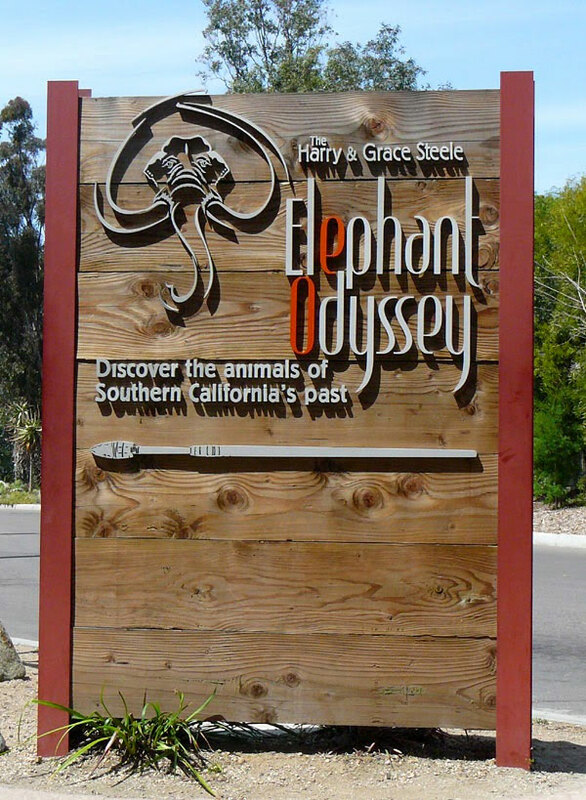 And now we come to the main draw of Elephant Odyssey which, of course, is the elephants. 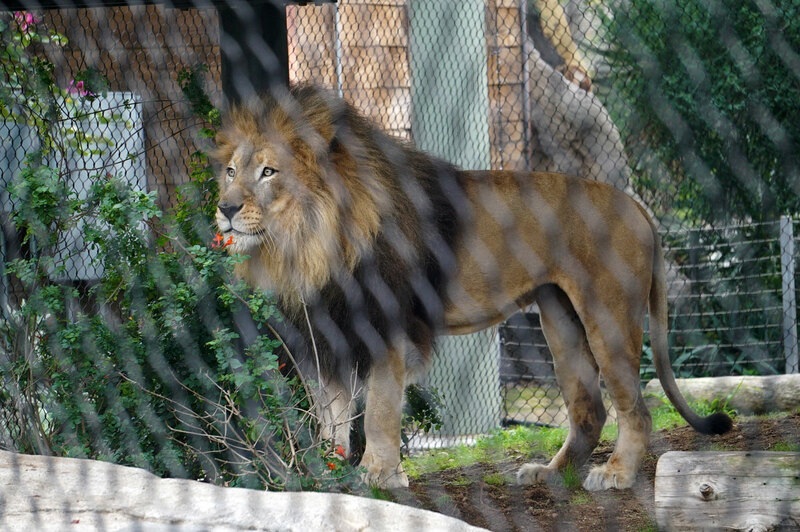 The enclosure is 2.4 acres and includes a 137,000 gallon pool. 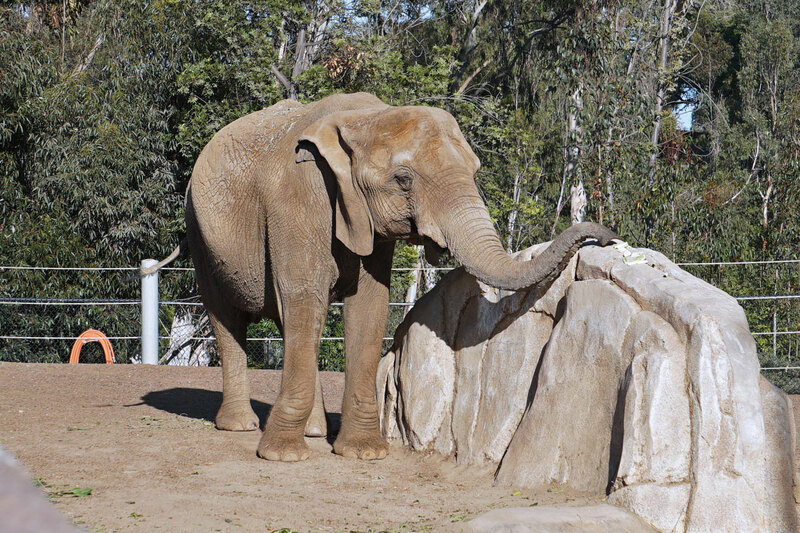 Scattered throughout the enclosure are things to keep the elephants entertained. 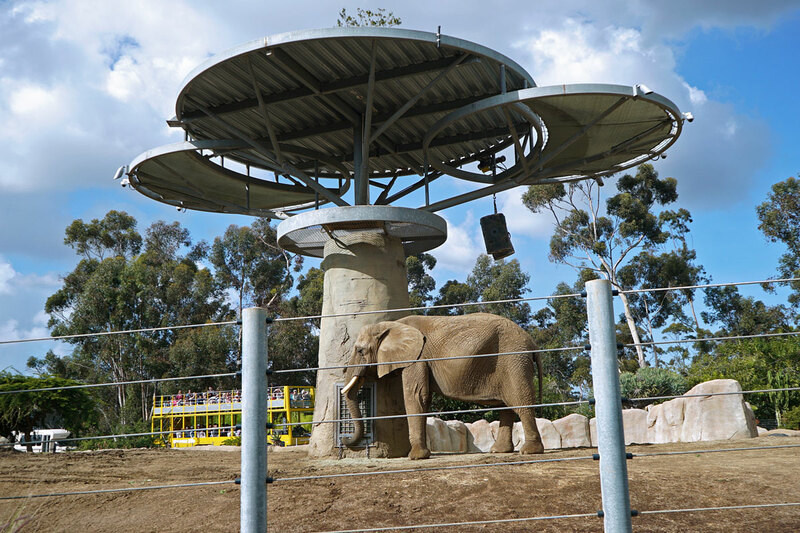 The elephants are fed by way of these "utili-trees", which provide food from containers hanging above and from the base. They are made of concrete and steel, which prevent the elephants from destroying them, and helps to keep them stimulated. 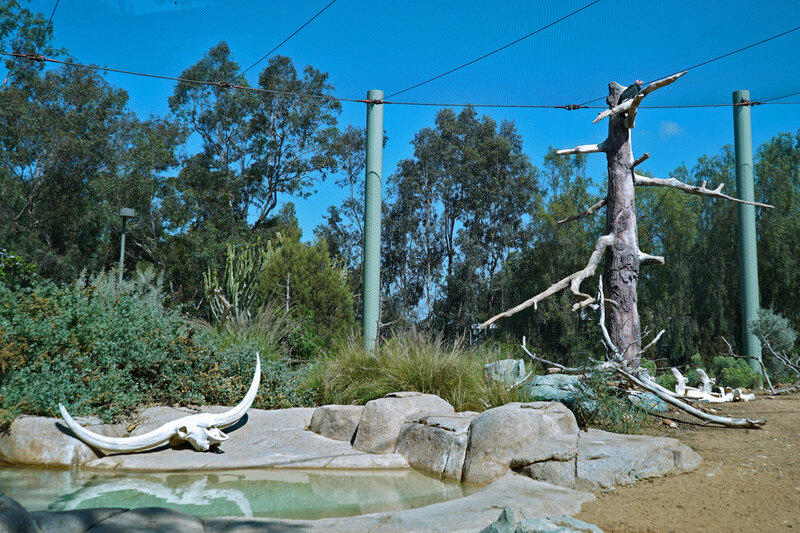 At present, there are four elephants in the enclosure. 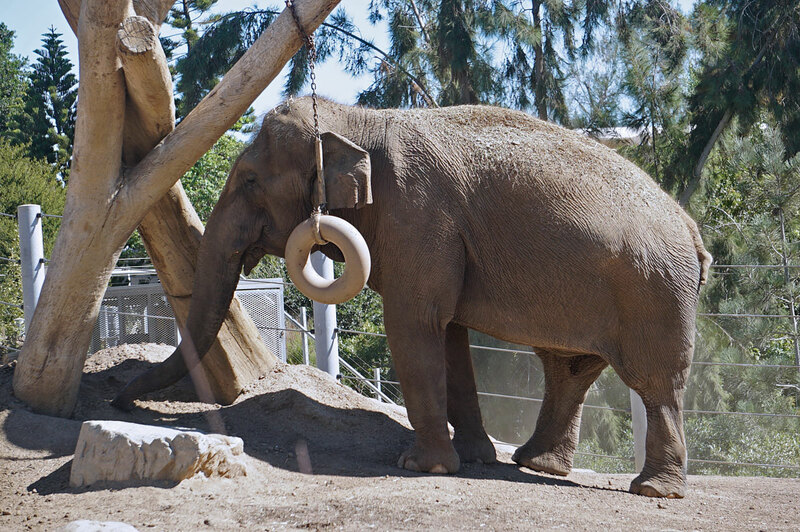 This is Mary, a female Asian elephant, born in 1964. She is the oldest of the four. 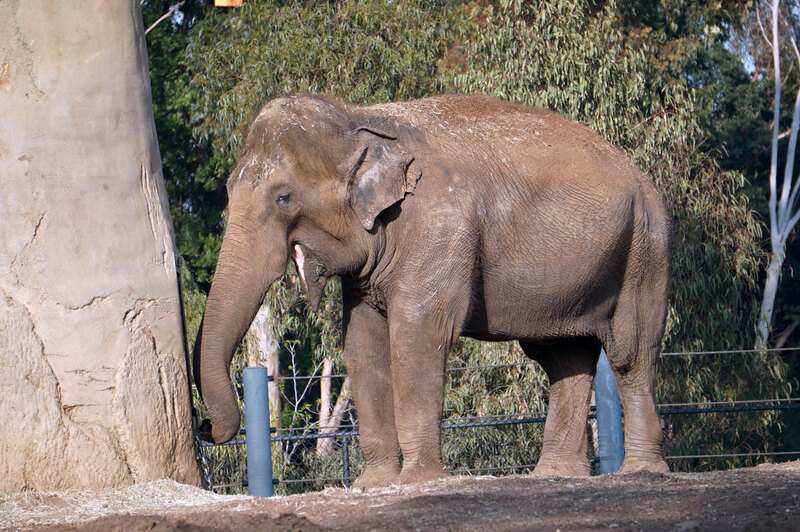 Devi is another female Asian elephant, born in 1977. She can be identified by her short, stubby tail. 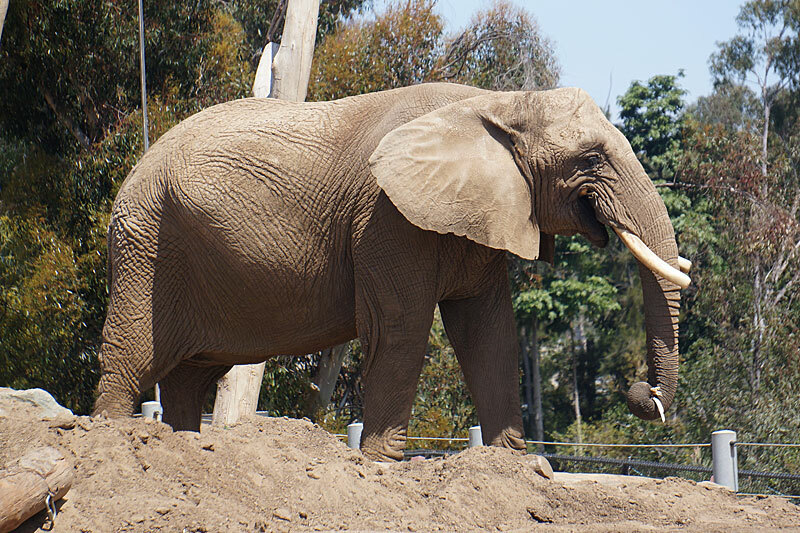 Tembo is a female African elephant, born in 1971. She is missing a part of her right ear. The youngest of the group is Shaba, a female African elephant. She was born in 1980 and is easily identified by her long tusks. 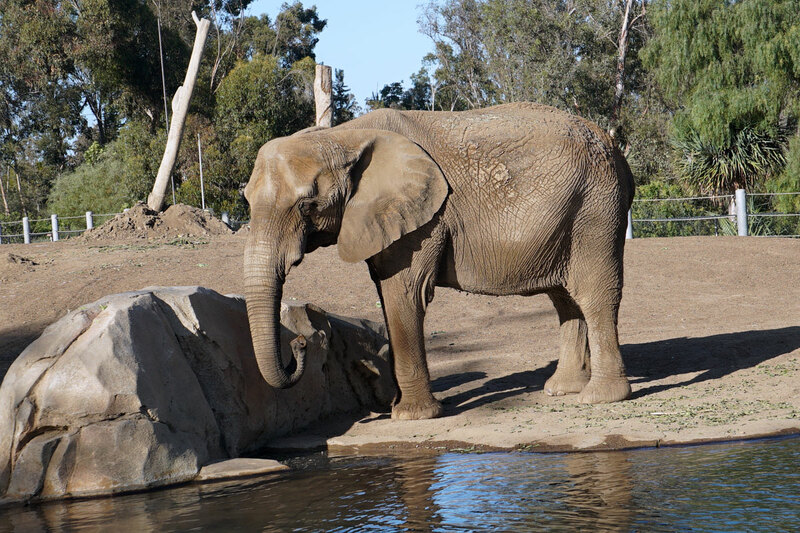 African elephants can be identified by their large ears which are shaped similarly to the continent of Africa. 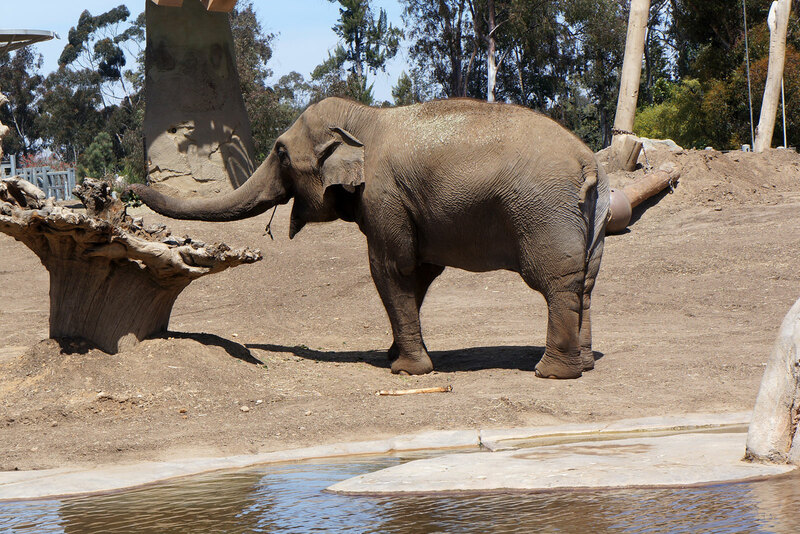 Asian elephants have much smaller ears. 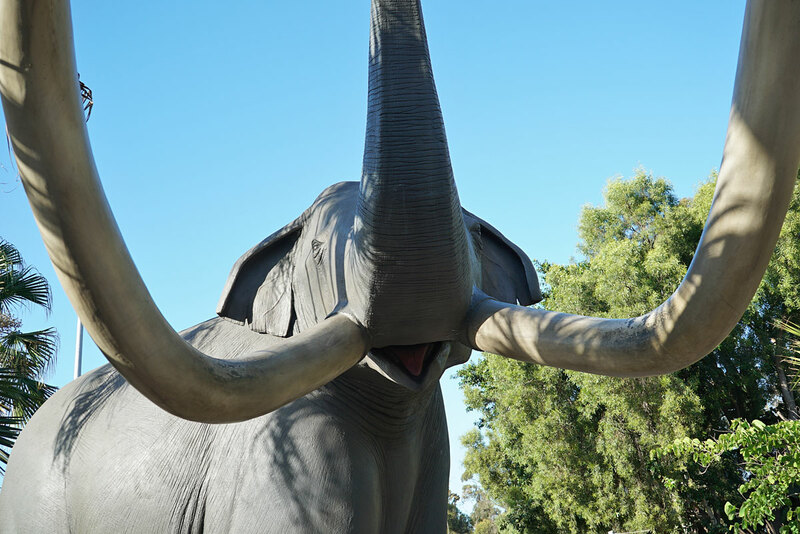 Also, only male Asian elephants have tusks, whereas both male and female African elephants have them. 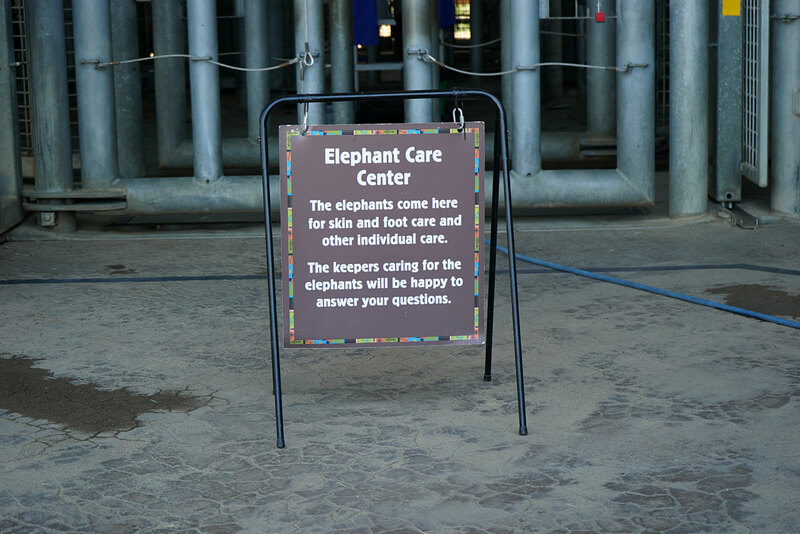 Near the center of the enclosure is the Elephant Care Center. 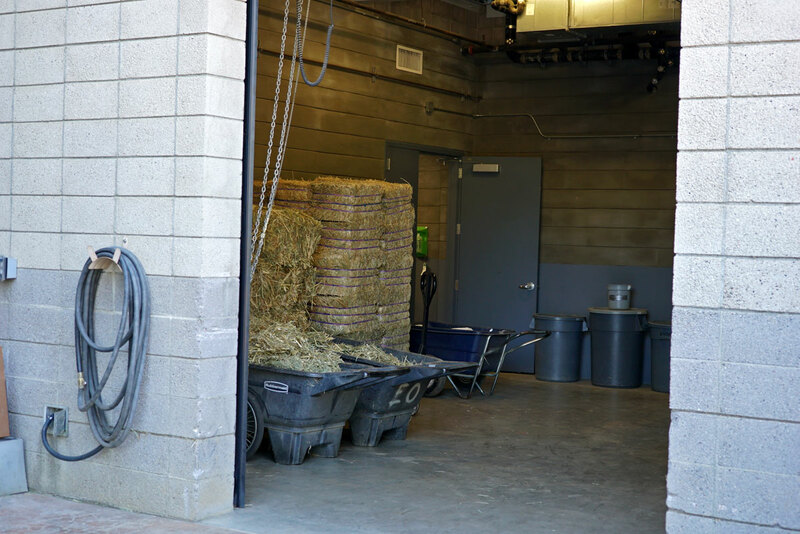 Hay for feeding the elephants is kept in the storage room. An audience gathers to watch keepers tending to one of the elephants. This elephant is getting a pedicure. 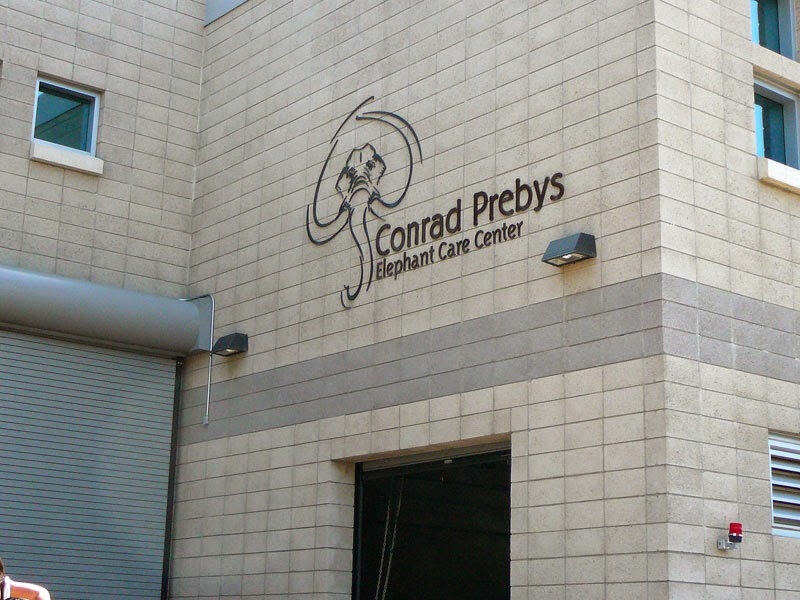 The zoo uses what is called "protective contact" when tending to the elephants. 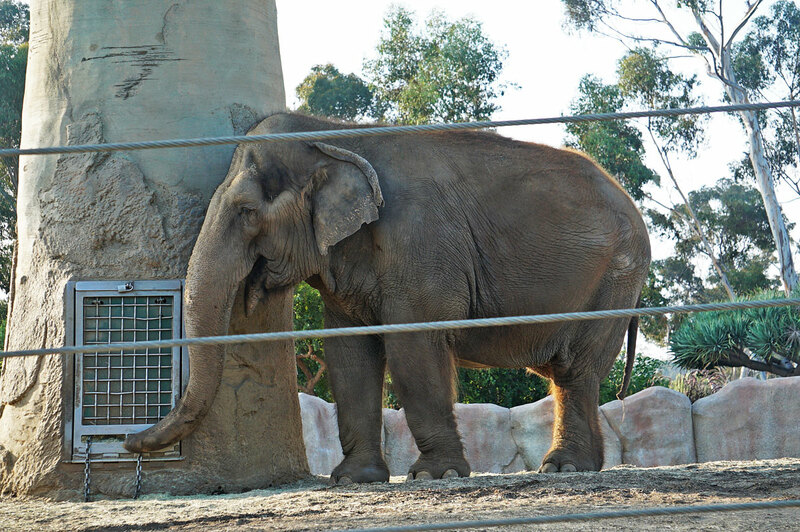 Ever since zoos have kept elephants, a keeper or trainer had been killed or injured on average, every two years. 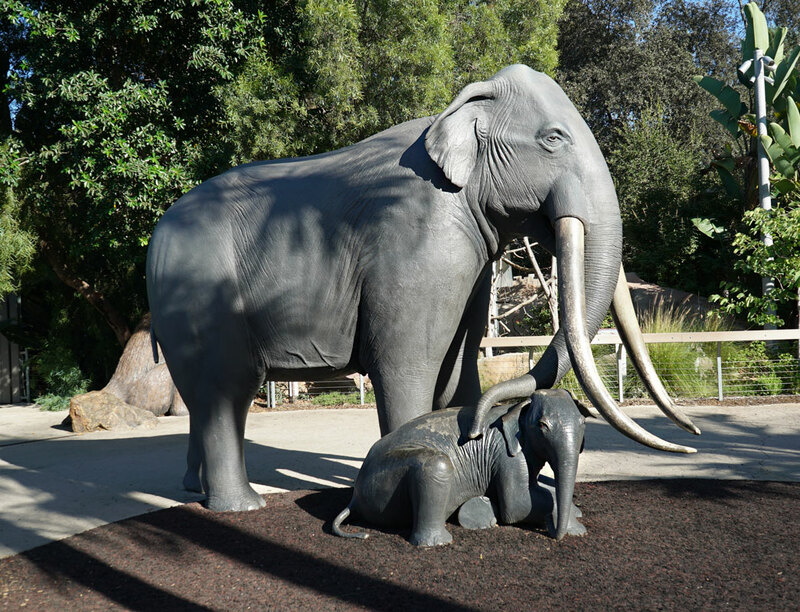 After the accidental death of a young keeper in 1991 at the Safari Park, who was caught in a confrontation between two four-ton elephants, the San Diego Zoo designed a safer way for staff to interact with the elephants. 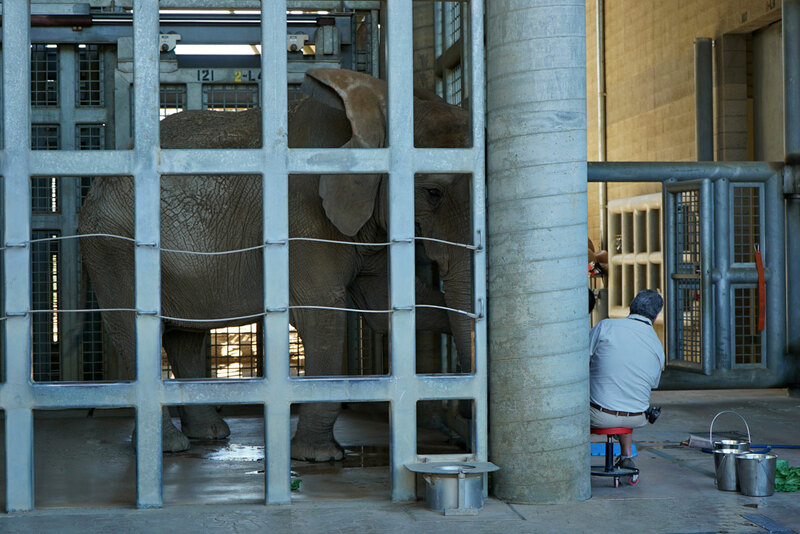 The new way keeps trainers and elephants separated by a heavy metal gate. This method has since become the industry standard. 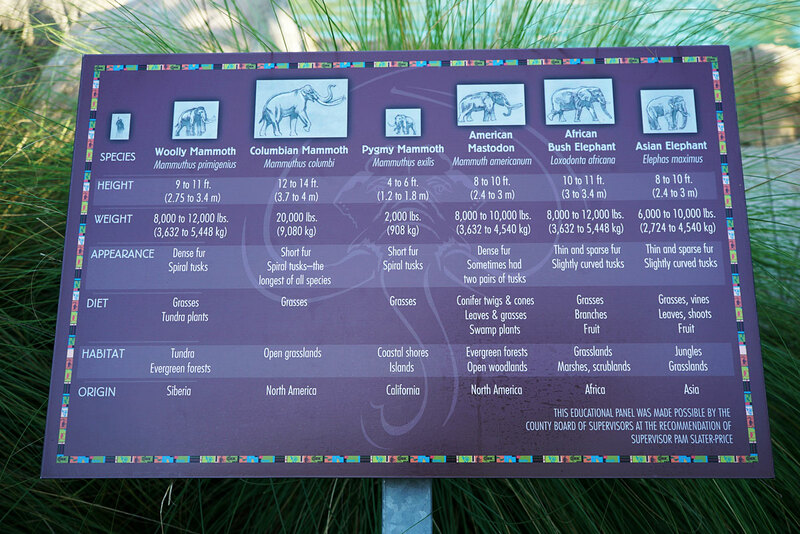 This chart compares today's elephants with those of the past. 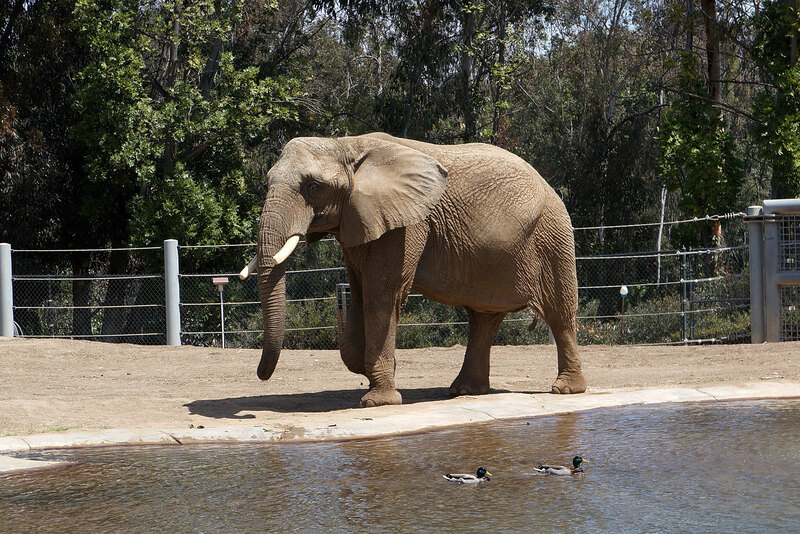 Shaba takes a stroll by the pool. 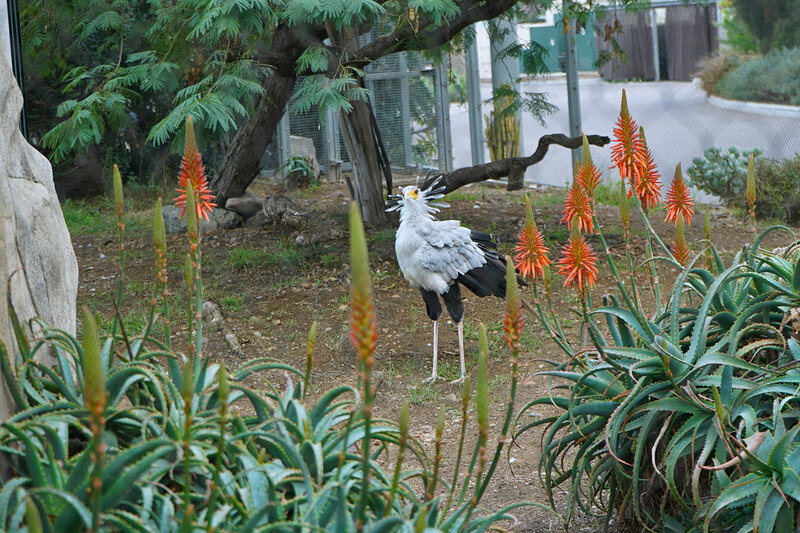 Near the Elephant Care Center is a small enclosure where you'll find the Secretary Bird. 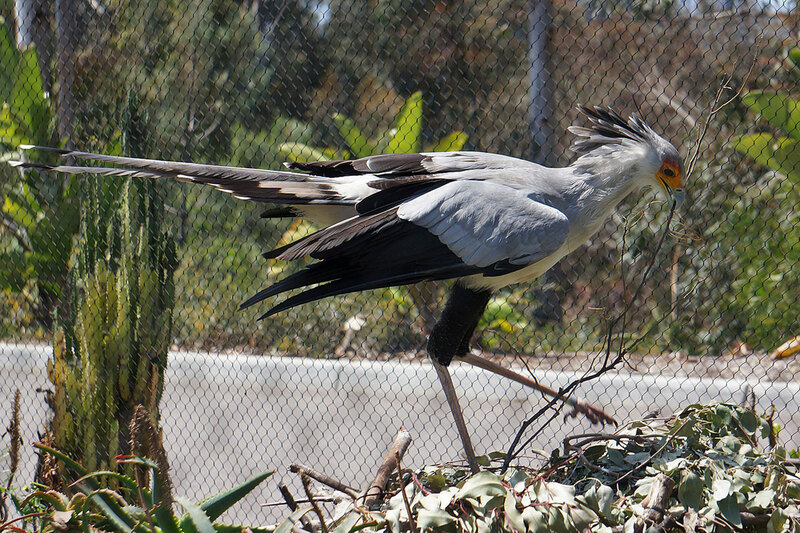 The Secretary Bird comes from Africa. And no, they don't take messages. 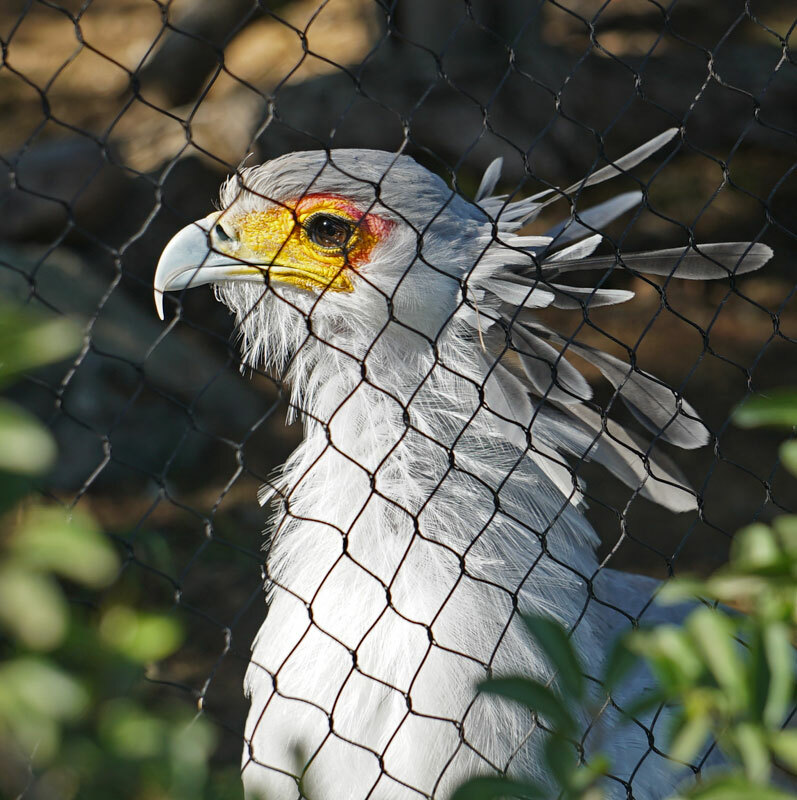 Their name comes from the Arabic saqr-et-tair, meaning "hunter bird". This "hunter bird's" name is Stella. 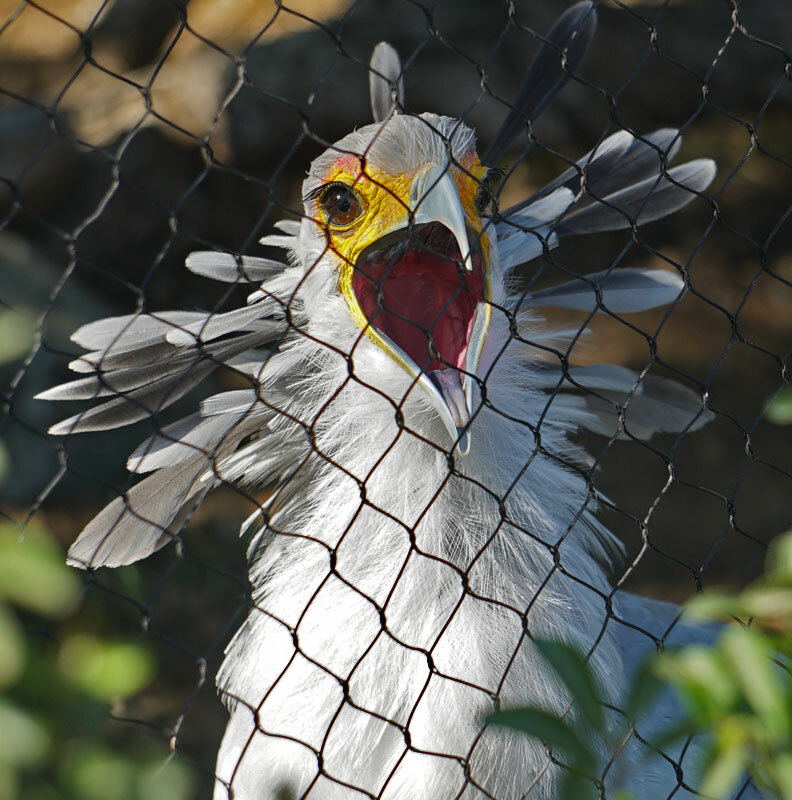 Stella is one of my favorite birds at the zoo, so I visit her often. 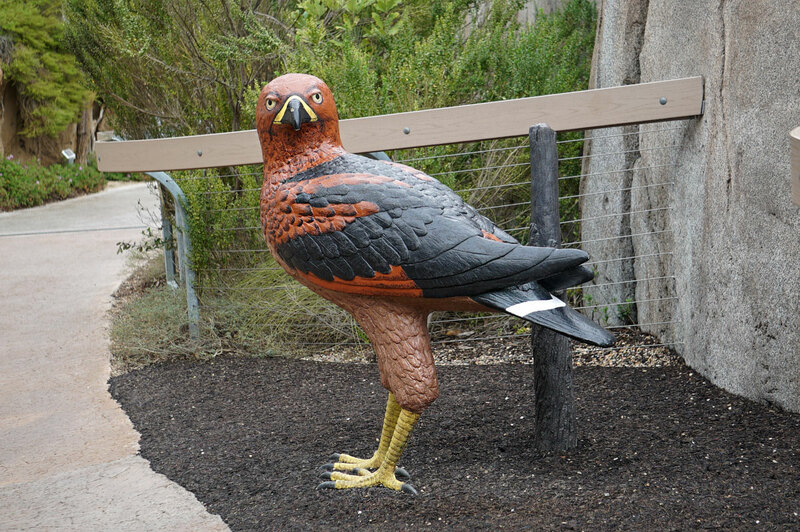 Outside the enclosure is a sculpture of an extinct Daggett's Eagle. 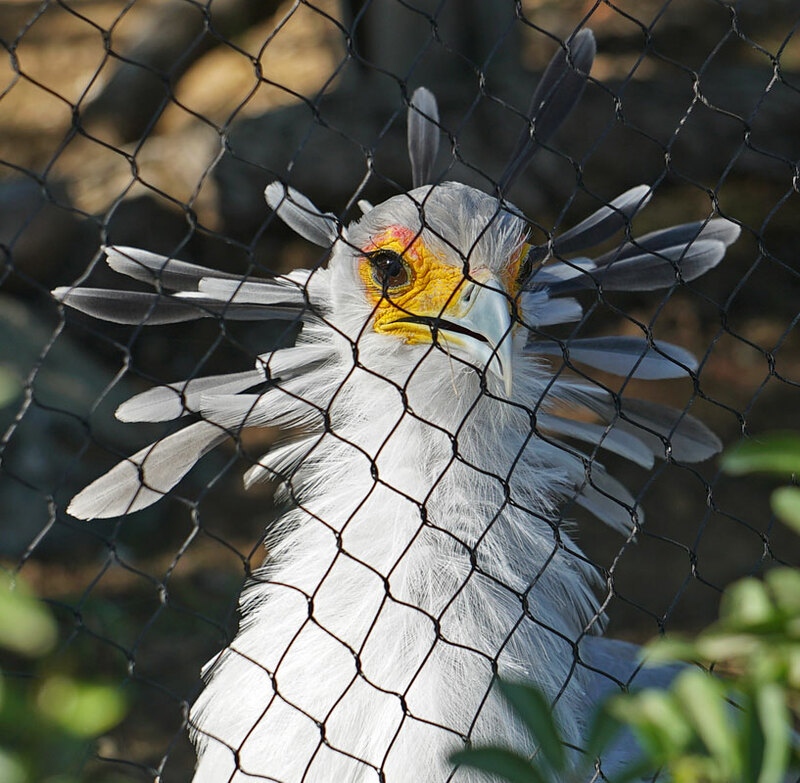 This bird had many similarities to the Secretary Bird. 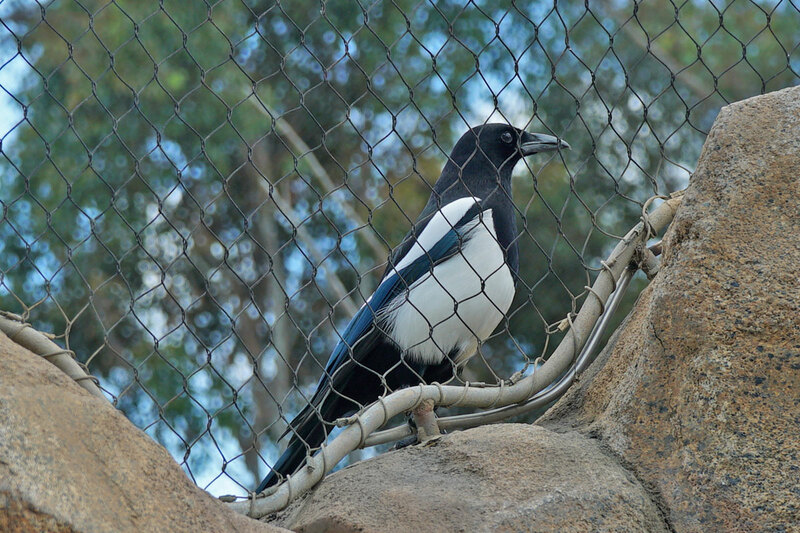 Sharing the enclosure with Stella is this Black-billed Magpie, from North America. And no, I don't know its name. Stella can be quite a character. Especially when she gets her feathers ruffled. Second to the last photo- Stella: "I don't believe it... It's that guy again... The one with the camera... Always with the camera." Last photo- Stella: "Ack! You there. Camera boy! What's a gal gotta do to get some privacy around here?! Beat it, bozo! (the nerve!)" Stella seems to recognize you, shyguy. 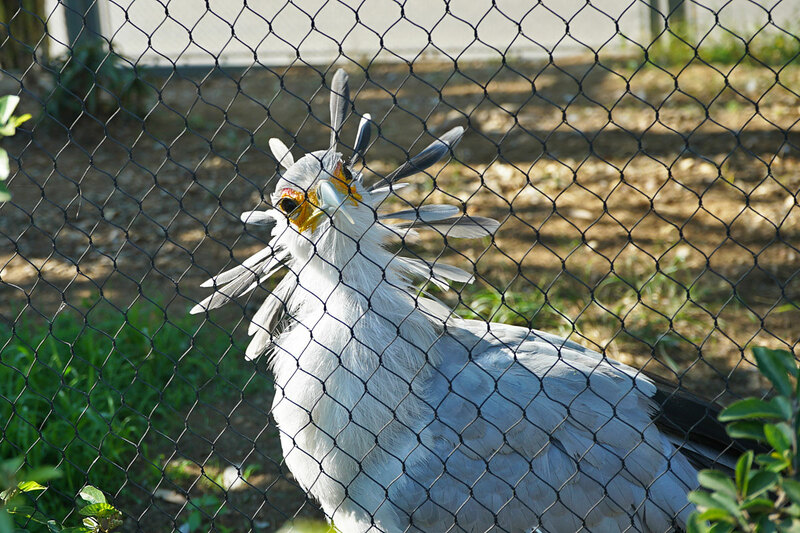 I can really see the dinosaur origins in this bird. 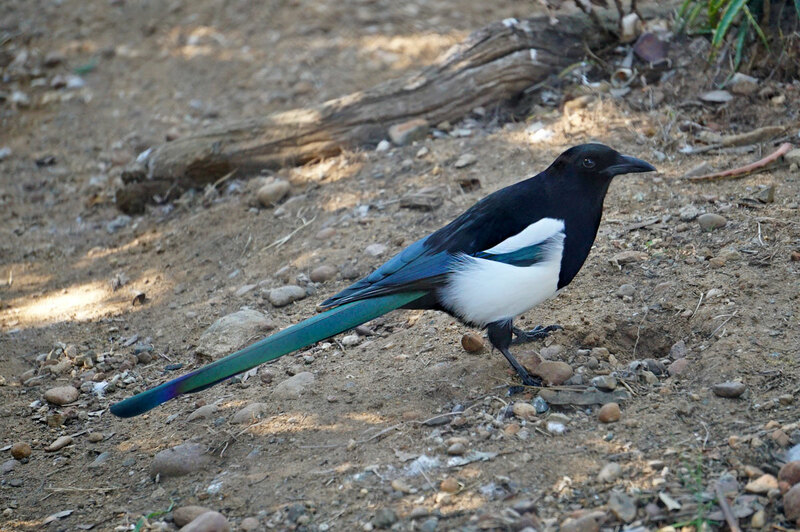 I think, as a kid, I read somewhere that these birds got their name from the crest feathers on their heads; which resembled the pens that (real) secretaries (back in the early 1900s) stuck behind their ears- ready to take dictation... I like the explanation given here better. 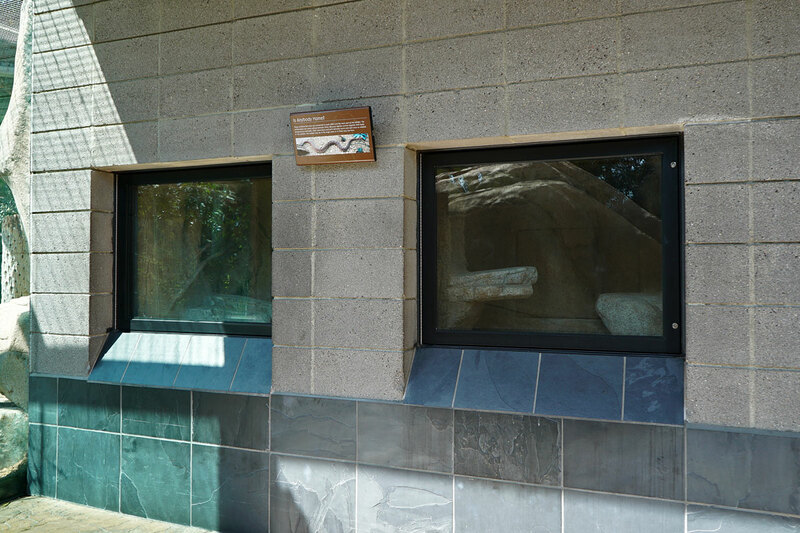 The next enclosure houses an assortment of animals. The most prominent are the Guanacos. 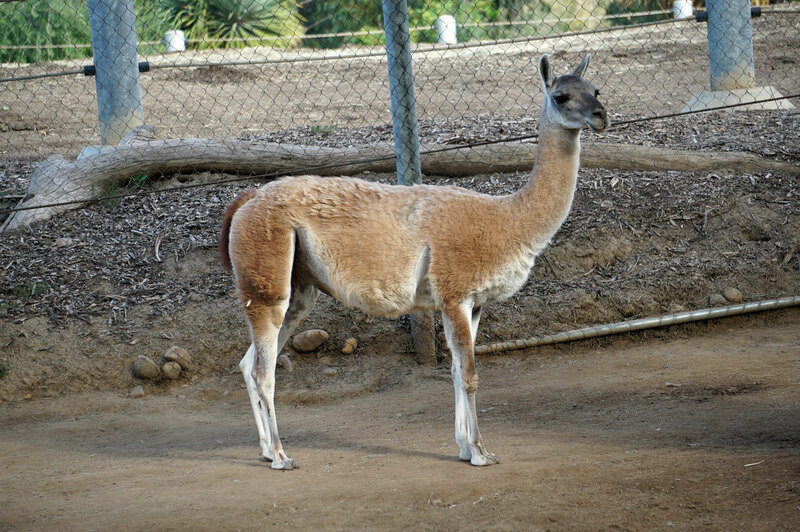 Guanacos live in the Andes Mountains in South America and are the wild relatives of the domesticated llama. 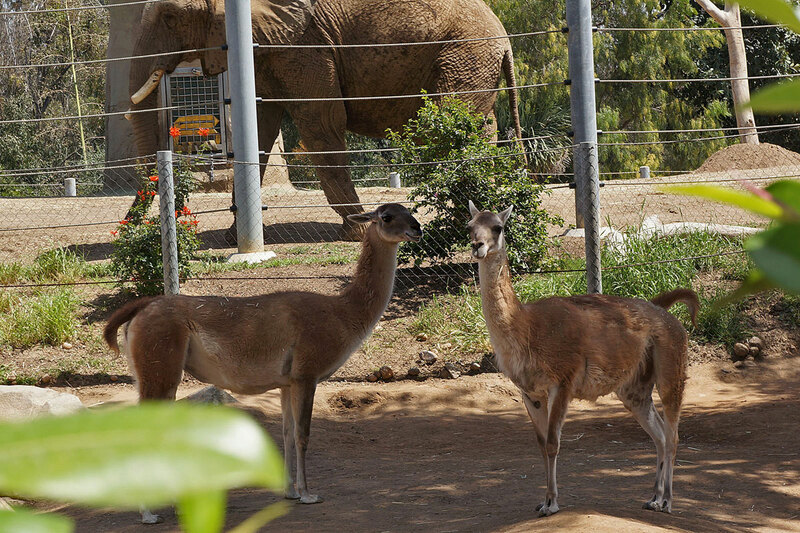 The elephant's enclosure is right behind the Guanaco's. Living amongst the Guanacos is a solitary llama. 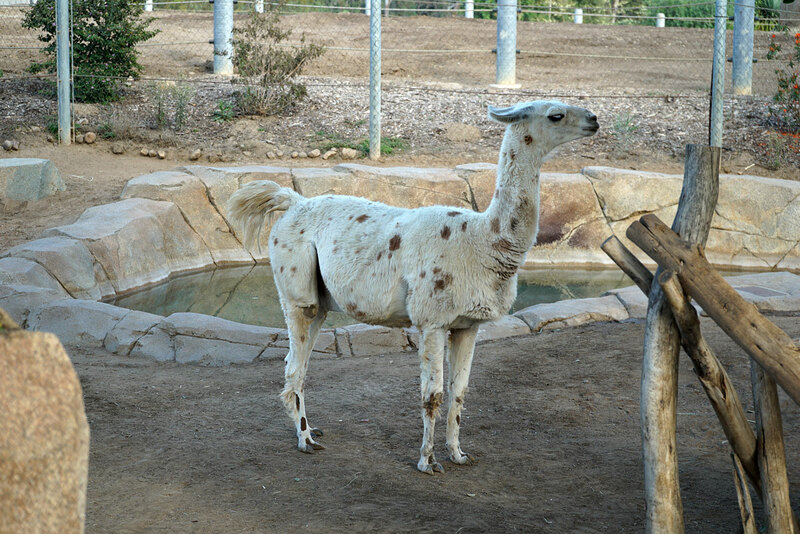 Llamas are also from South America, and have been domesticated there for their wool and for hauling heavy loads. 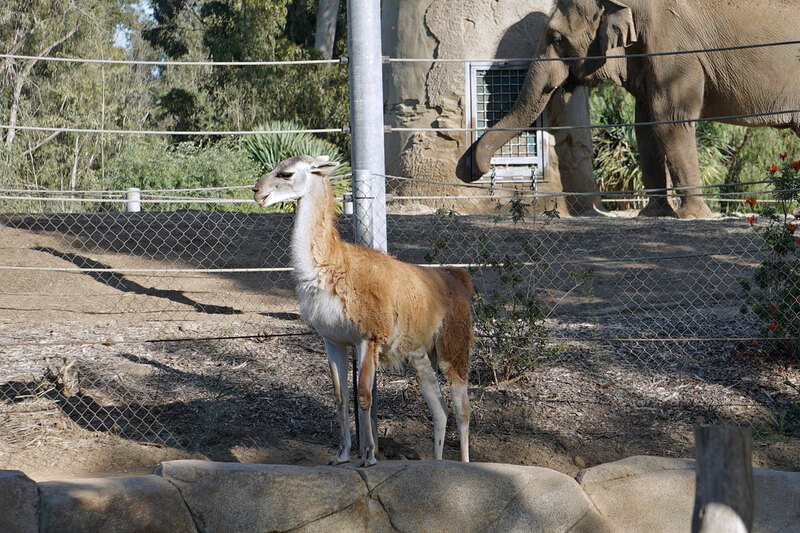 Here is the llama with a Guanaco nearby, elephants in the background, and on the ground below, a Capybara. 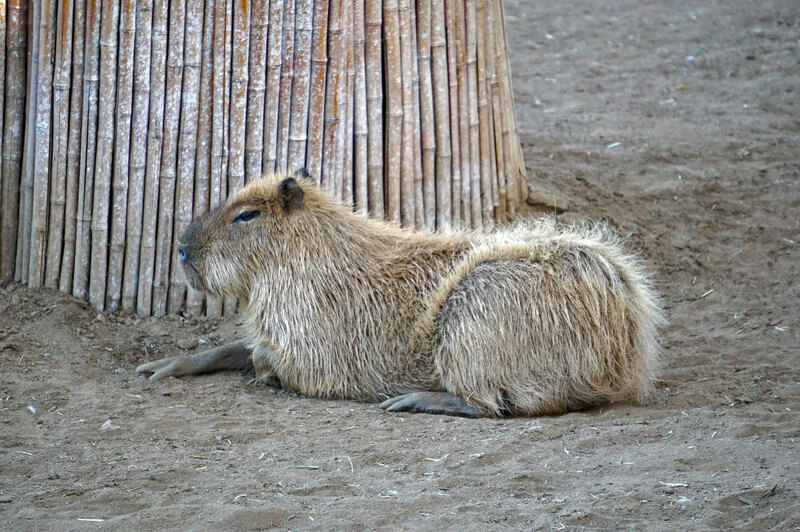 The Capybara, from South America, is the largest rodent in the world. 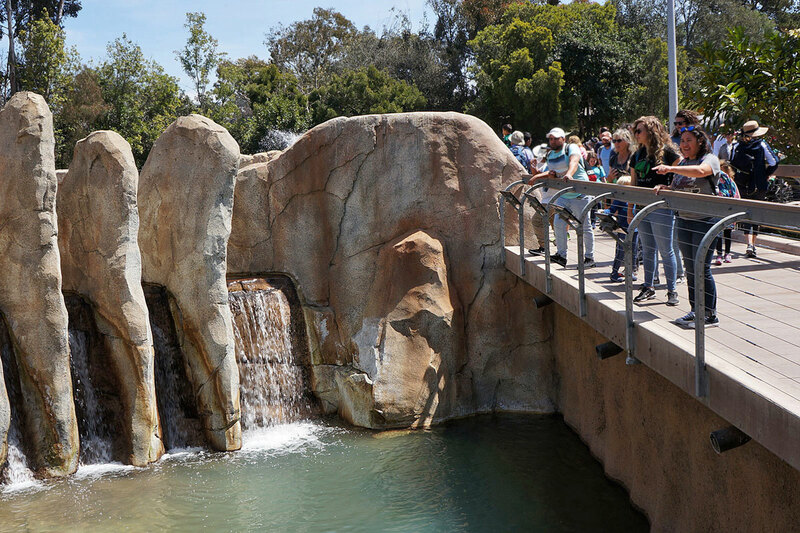 Guests can get a good view of the animals form above this small pool, fed by a number of small waterfalls. 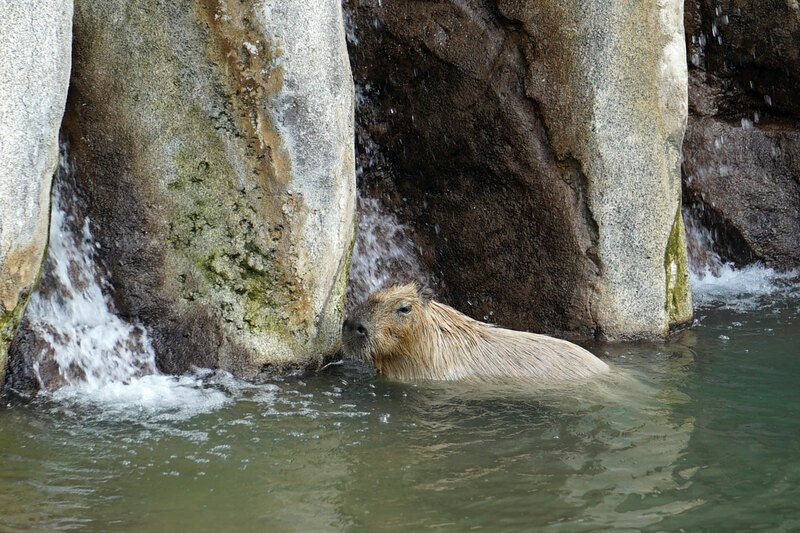 The animals can drink and bath in the pool, like what this Capybara is doing. 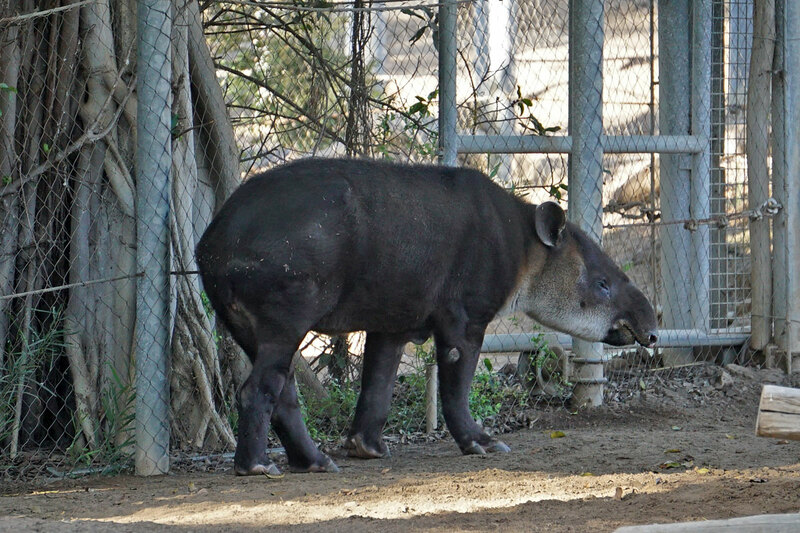 The fourth species of animal in this exhibit is the Baird's Tapir, from Central America. 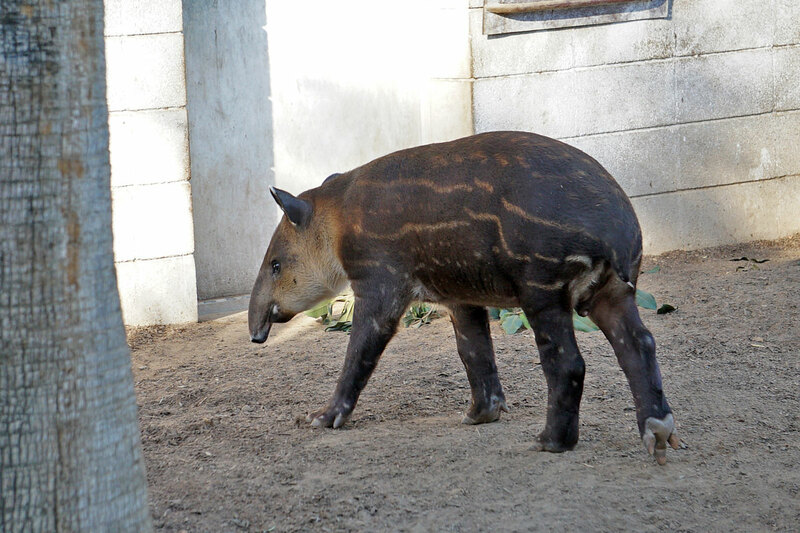 This young tapir was born here on June 13, 2018. In the third photo, you've managed to capture one of the rarest of beasts: The Guanacus Animatronicus! You can see the supports under his front legs which control his movements, just like in PC. Part of the 'support' is the steel pipe from the fencing behind him. But I'm not sure what that thin black vertical thing is. Guanacos seem so cuddly and friendly; like plush toys. 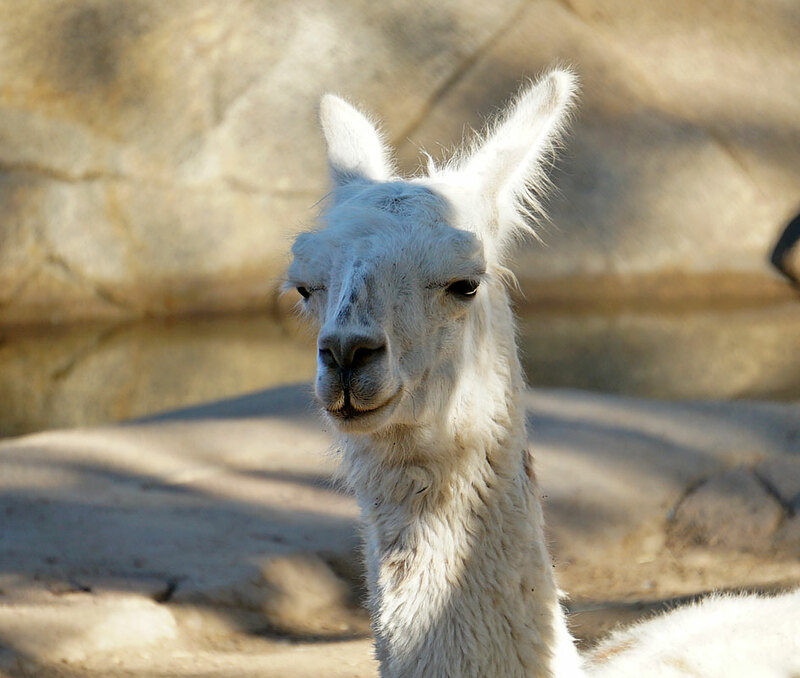 I wonder if they're prone to spitting on people like their cousins, the llamas. 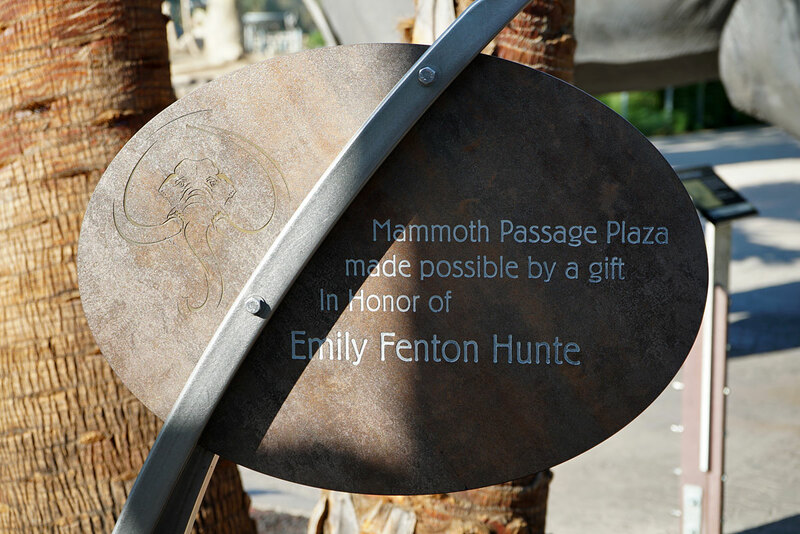 Near the west end of Elephant Odyssey is Mammoth Passage Plaza. 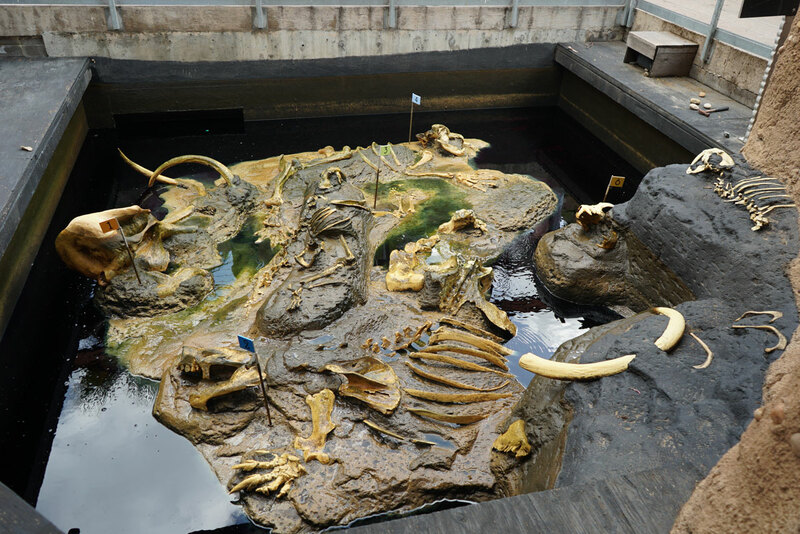 Here you'll find life-size sculptures of a family of extinct North American Columbian Mammoths. This is the male. 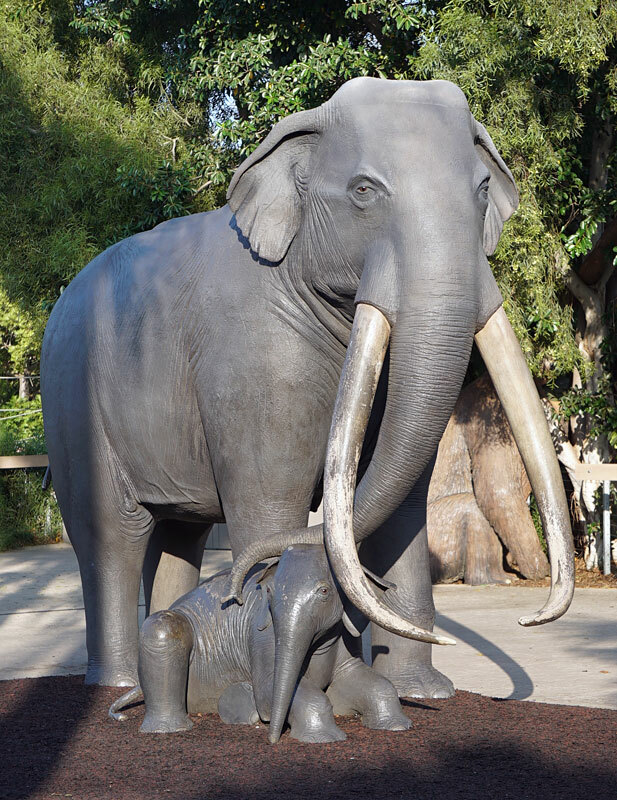 A mother and baby mammoth can be found nearby and is a popular photo spot for tourists. 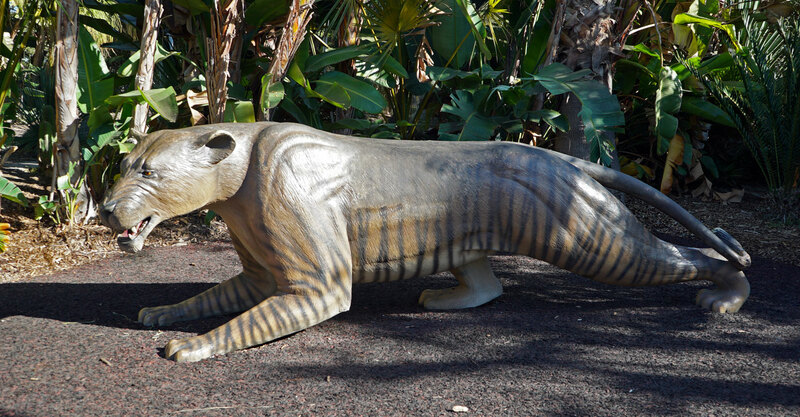 Towards the far end is this sculpture of an extinct North American Lion. They were 25% larger than today's African Lion. This sculpture is usually usually full of kids, crawling on its back. But I got lucky and got this shot during a slow period. Towards the back of Mammoth Passage Plaza is a small enclosure that can easily be overlooked, as the residents are usually difficult to find. 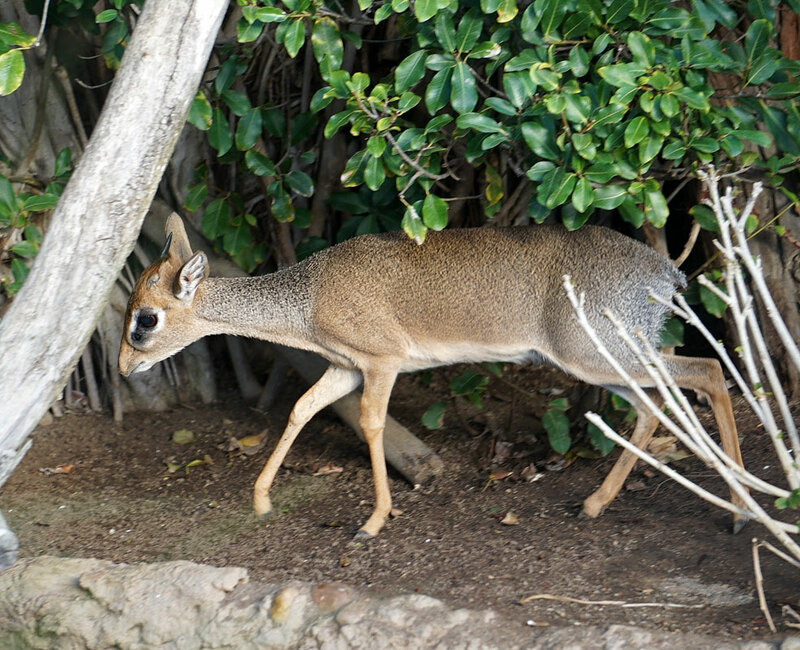 Foraging around the bottom of the enclosure is the Kirk's Dik-dik. 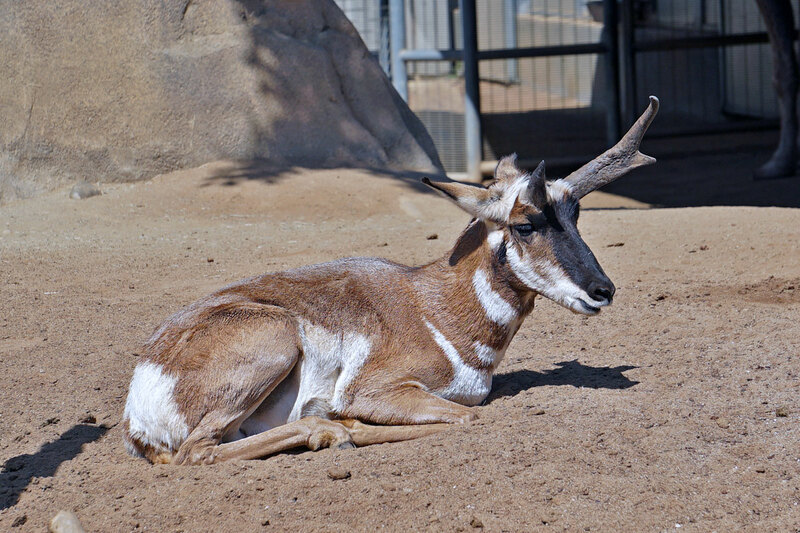 This shy animal is a small antelope from Africa which usually hides in the back of the exhibit. It took several visits to finally get some photos. The Dik-dik in his shy pose. 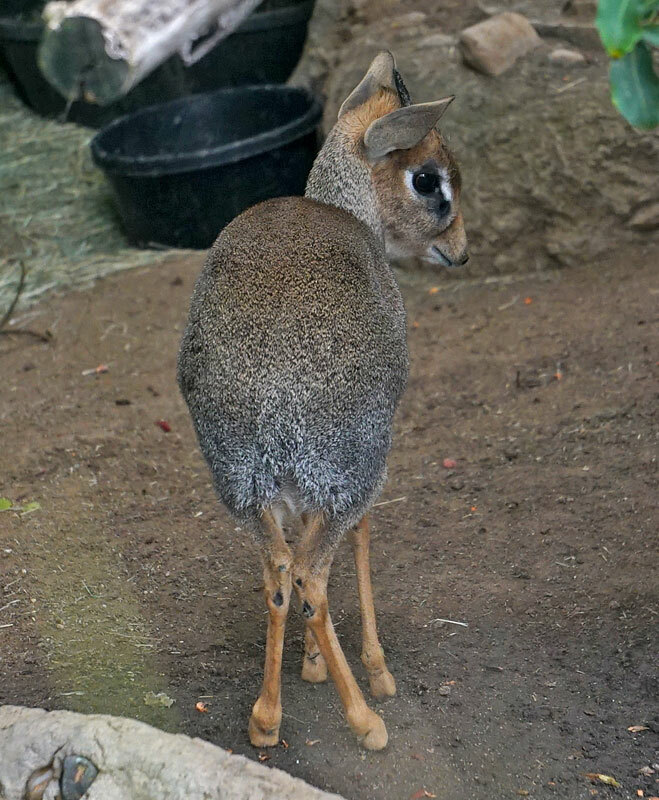 The name Dik-dik is an imitation of the alarm call these tiny antelope make. 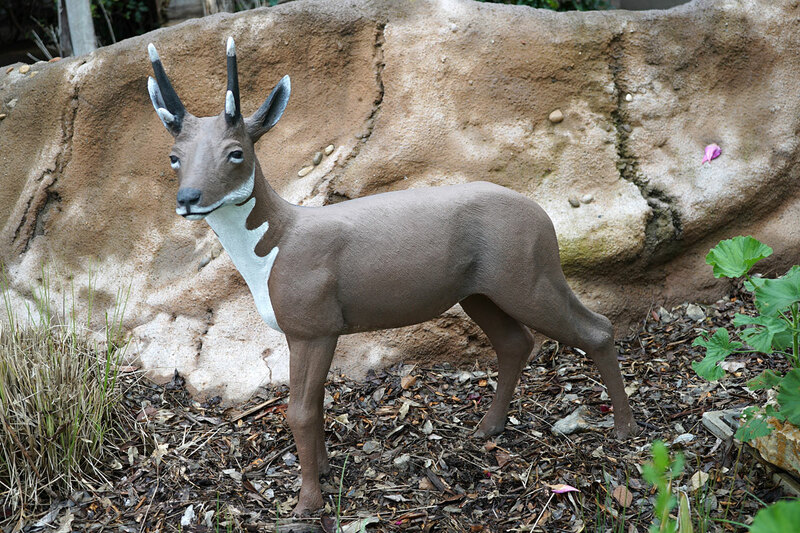 A sculpture of a prehistoric Dwarf Pronghorn stands outside the enclosure, a distant relative to the Dik-dik. 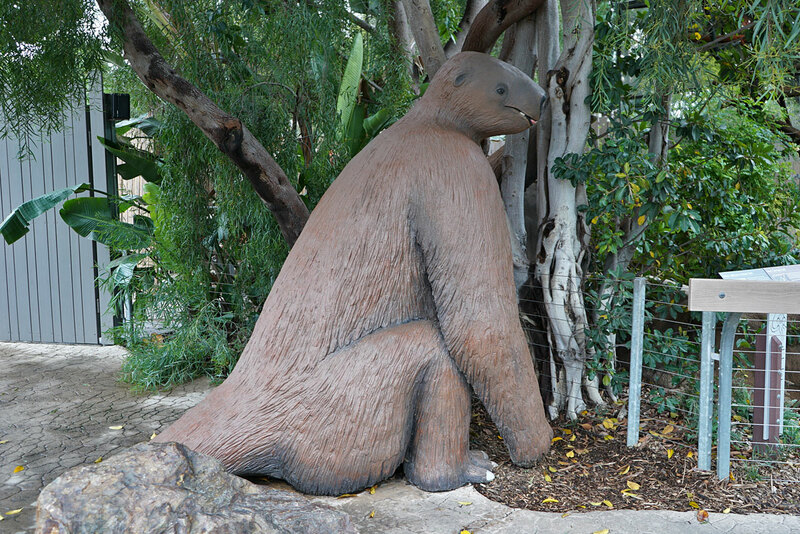 A large sculpture of the extinct Jefferson's Ground Sloth also stands outside the enclosure, a distant relative to the Two-toed Sloth. 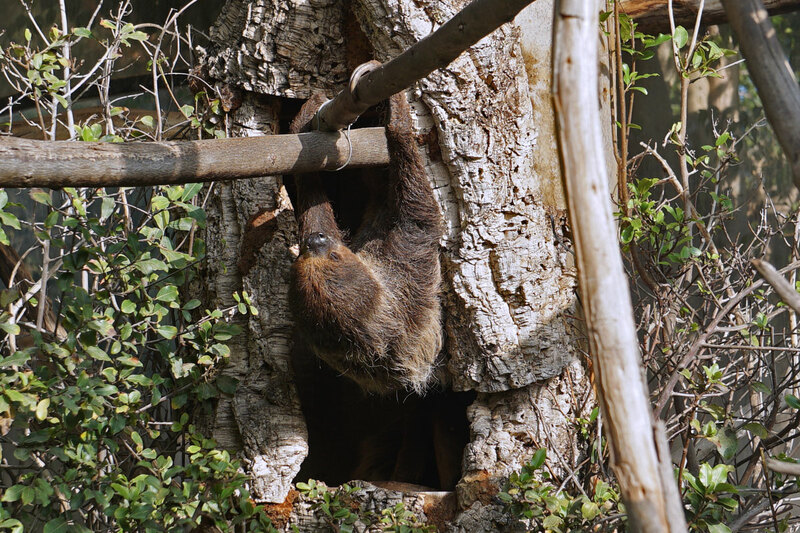 The Linne's Two-toed Sloth is even harder to find, as he spends most of the day curled up inside his burrow. After visiting the zoo for several years, this was the first time I actually say him emerge. As he emerged, it appears he must have had a rough night. 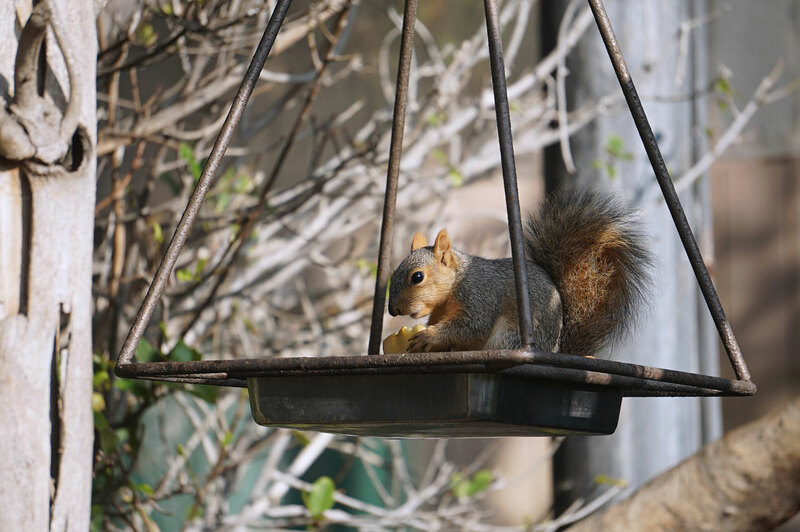 I realized he was up because it was meal time, and if he didn't get to this food in time, the crafty squirrels would be happy to eat it for him. After about 5 minutes, our sloth has fully emerged from his burrow and is on his way to his meal. 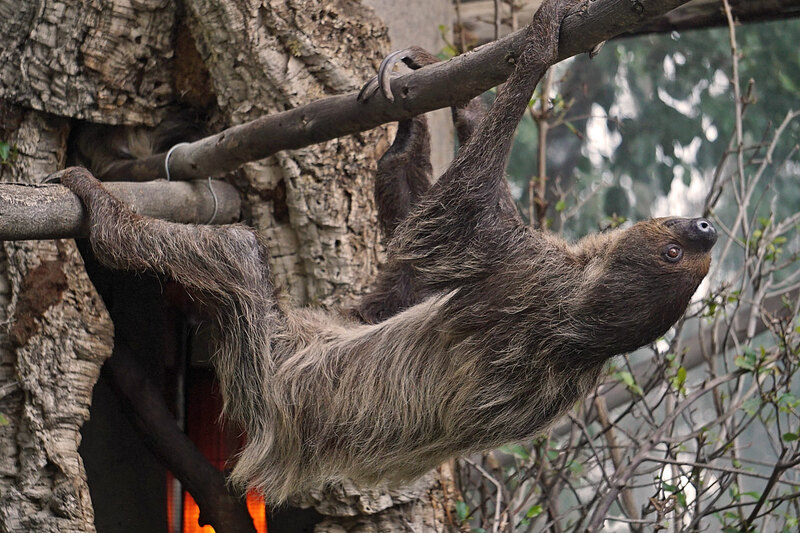 Sloths are among the slowest moving animals in the world. 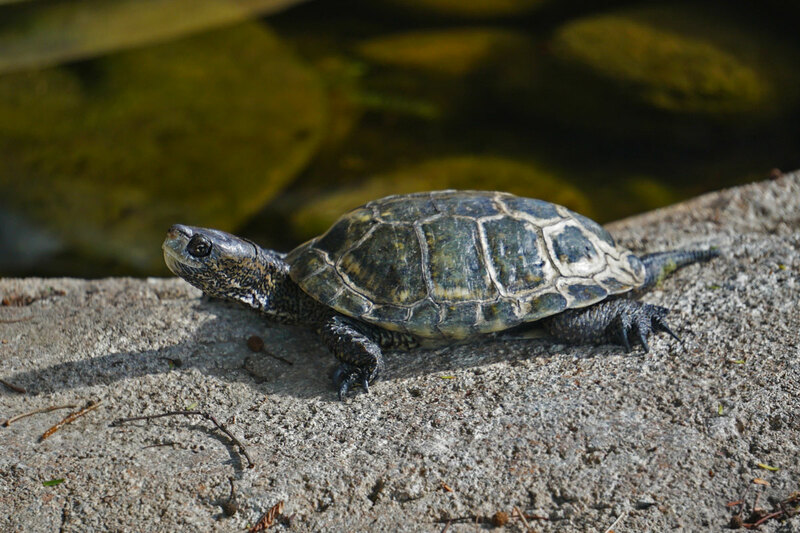 Turtles move faster than they do. Luckily, he made it to his meal before the squirrels were able to eat all of it. 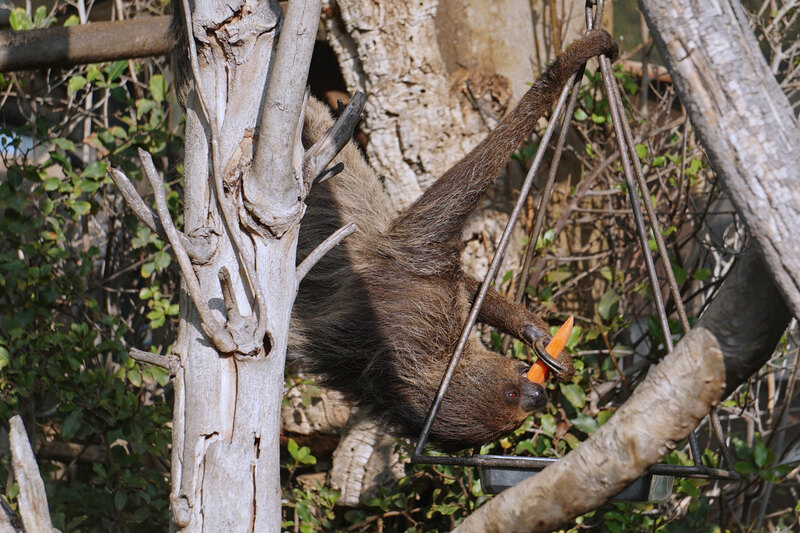 Sloths eat, and do most everything else, upside down. 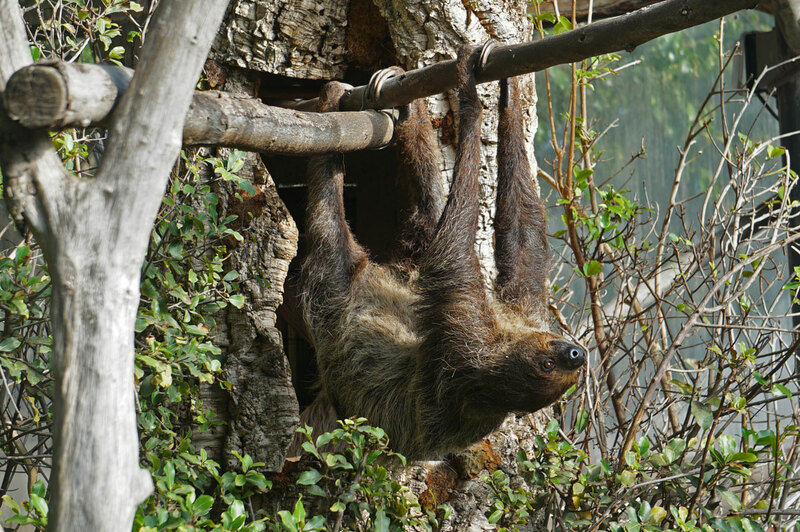 Their huge claws keep them clamped to the branch, even when sleeping. 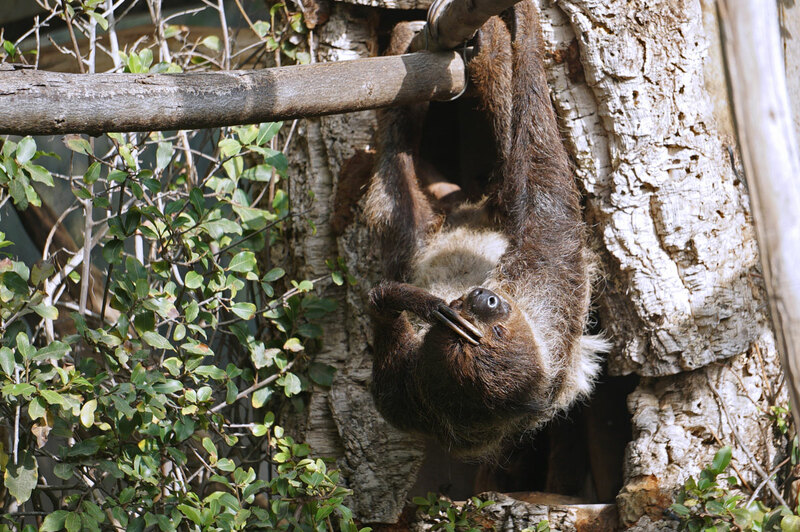 The Linne's Two-toed Sloth is found in Central and South America. Our sloth is now content and ready for another nap after the intense activity of climbing three feet to his food and back. Nice to see such a clear picture of the elusive Dik-dik. I was going to say something snarky about the sloth but you beat me to it with your captions. What's that glowing red area inside the sloth's burrow? A heater? Or maybe it's just some program playing on his big-screen TV. I'm still waiting to see the Tow -toed Sloth that you promised us in your subject title. Yes, the red glow is a heater, not a big screen TV, which if it was, might explain his reasons for rarely leaving his burrow. And thanks for the heads up on the title goof. 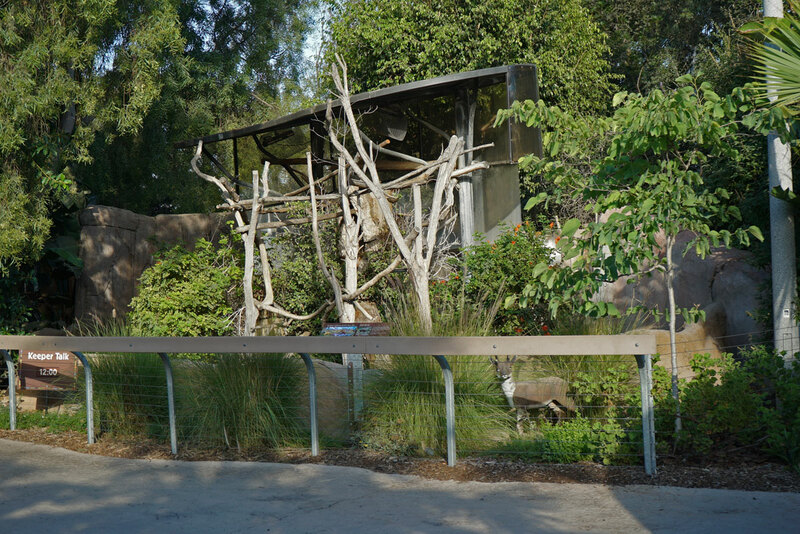 Right adjacent to Mammoth Passage Plaza are the African Lions. 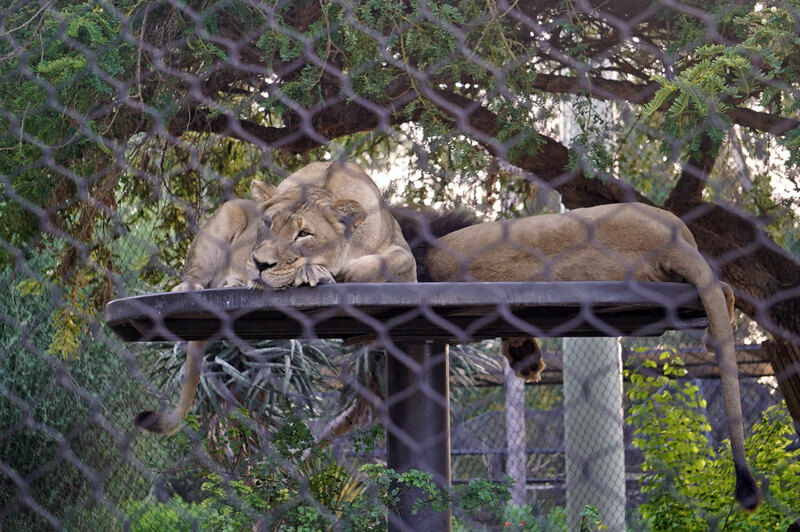 The lion pair kept here are each around 20 years old, making them both senior citizens. 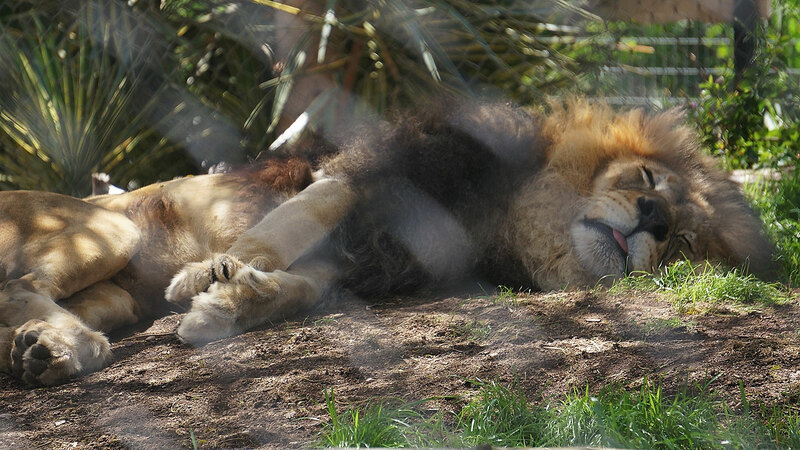 So when visiting the exhibit, you'll likely find them engaging in their favorite activity...sleeping. 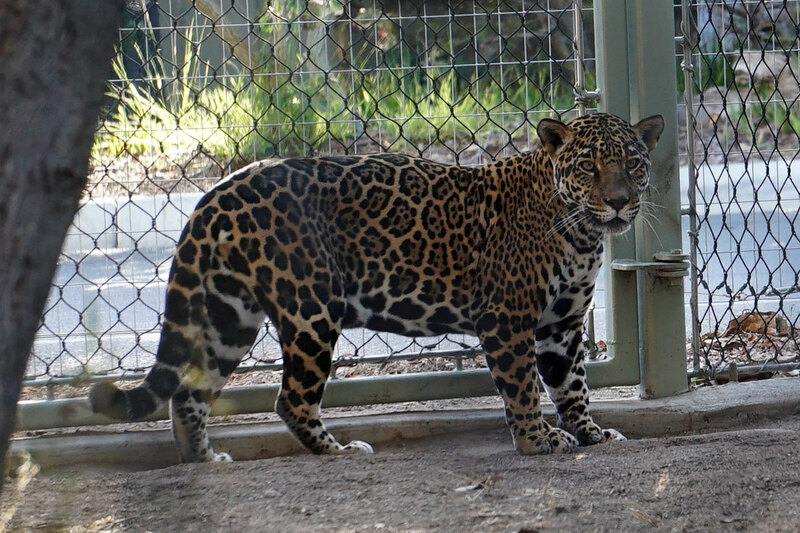 Next door, is a much more active Jaguar. 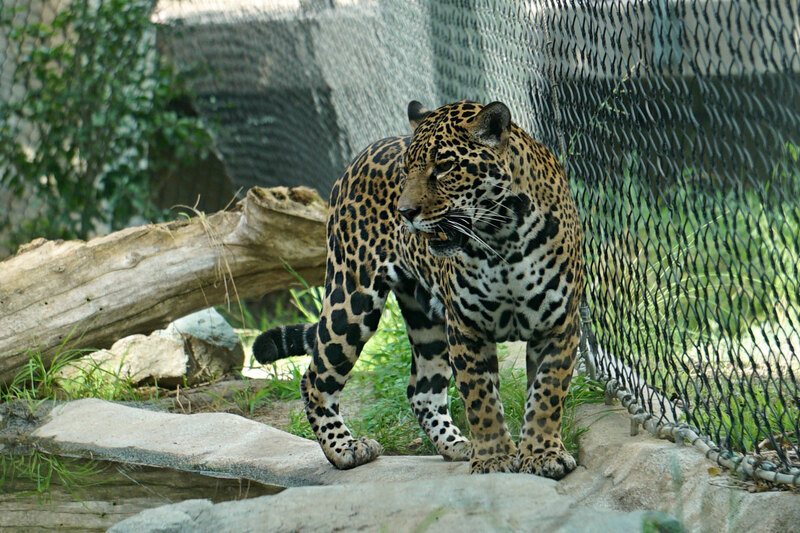 The Jaguar can be found in Central, South, and North America. It is the largest cat in the Americas. 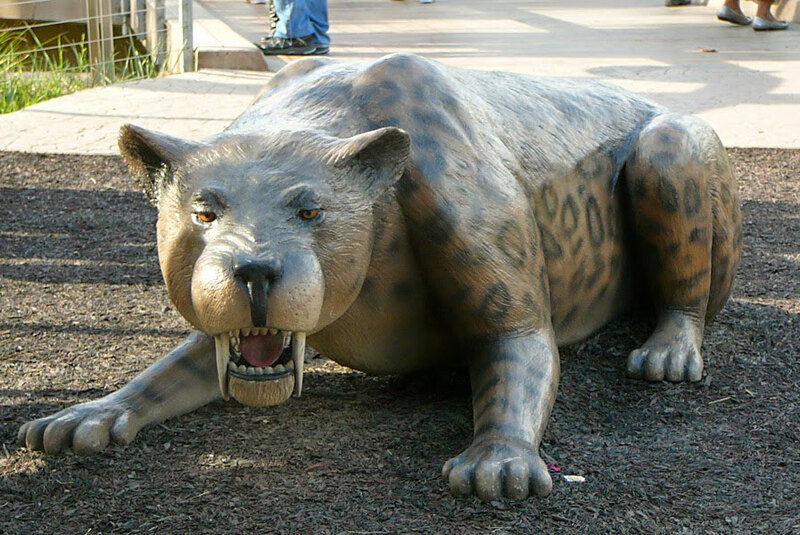 A Smilodon sculpture sits outside the exhibit, also known as the Saber-toothed Tiger. You've got to be patient, or just lucky, to find the male lion up and active. Here he is sitting up on his "perch." 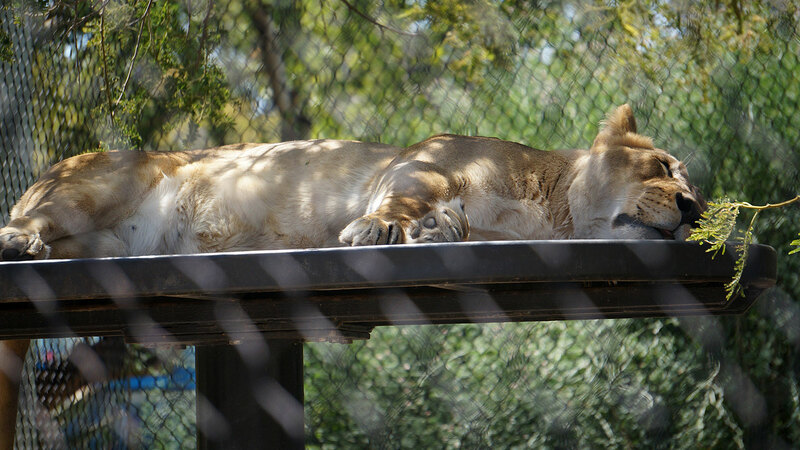 The Lioness takes a break from her nap to pose for the camera. The male giving his mate some loving. The displays of activity are usually few and far between, and this is how you're most likely to find the lions during most of the day. 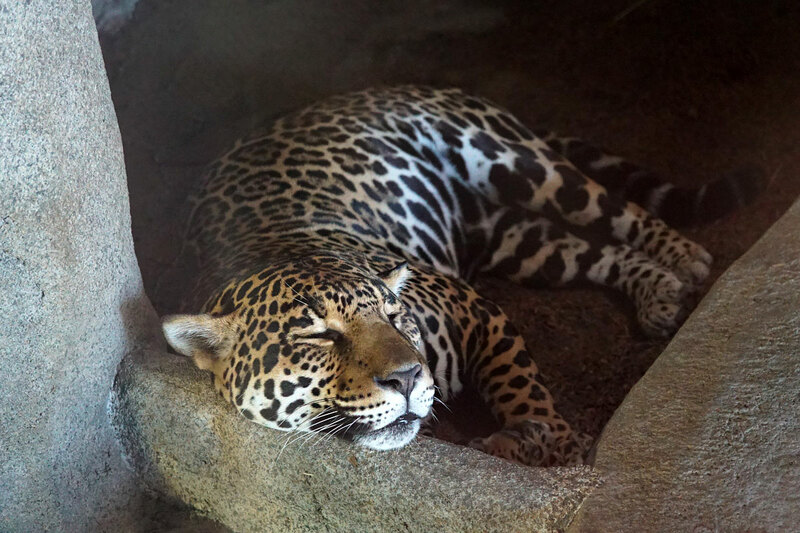 The Jaguar decides to follow suit and take a cat nap of his own. In the first photo, it looks like the lioness is sleeping. But she's got one eye on you.... lunch? 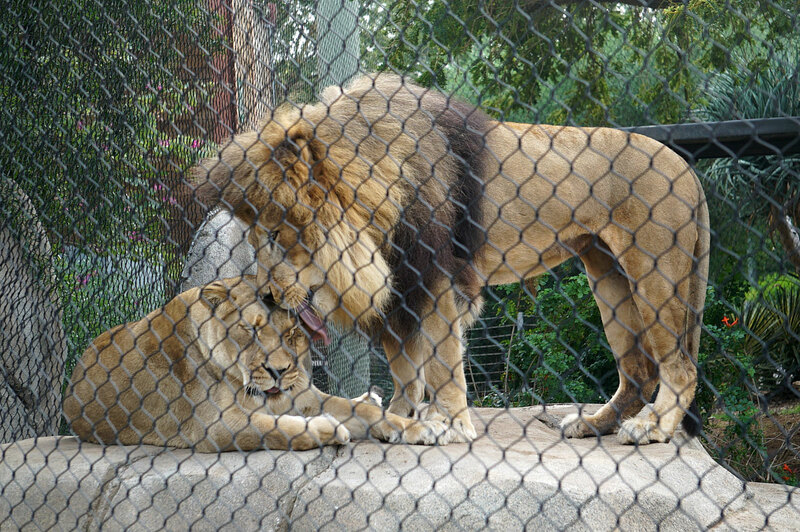 Quote: "You've got to be patient, or just lucky, to find the male lion up and active." Those red blossoms near his chin makes it look like he just had lunch.... shyguy, are you still here? Or maybe he's been eating Gummi Bears. 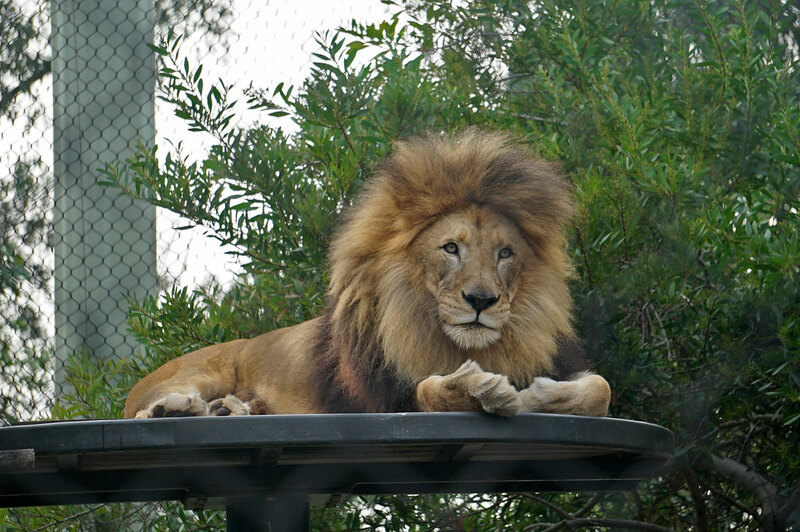 That's a real nice photo of the male lion sitting up on his perch. 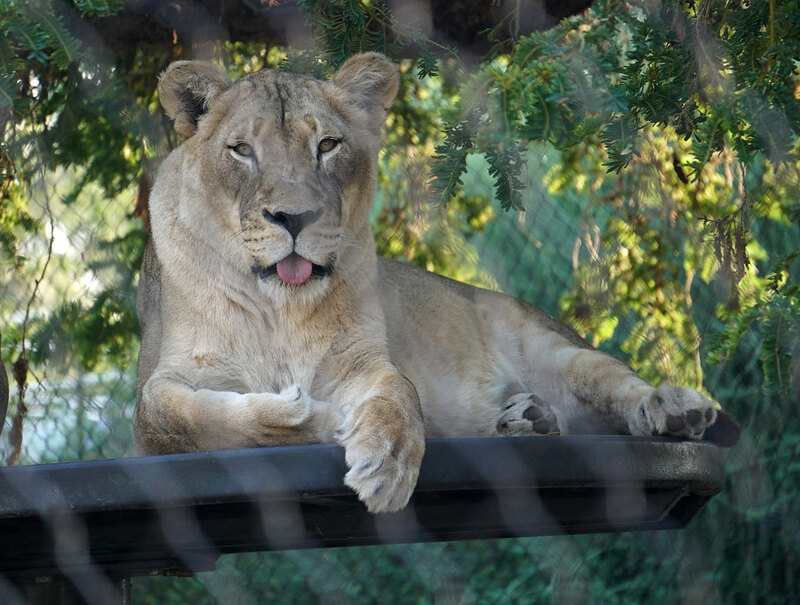 Quote: "The Lioness takes a break from her nap to pose for the camera." If you can call sticking her tongue out at you 'posing'. Quote: "The male giving his mate some loving." Awwww. Always love your comments, JB. Thanks. after seeing the images i would must say that this place is a must visit place with your kids. 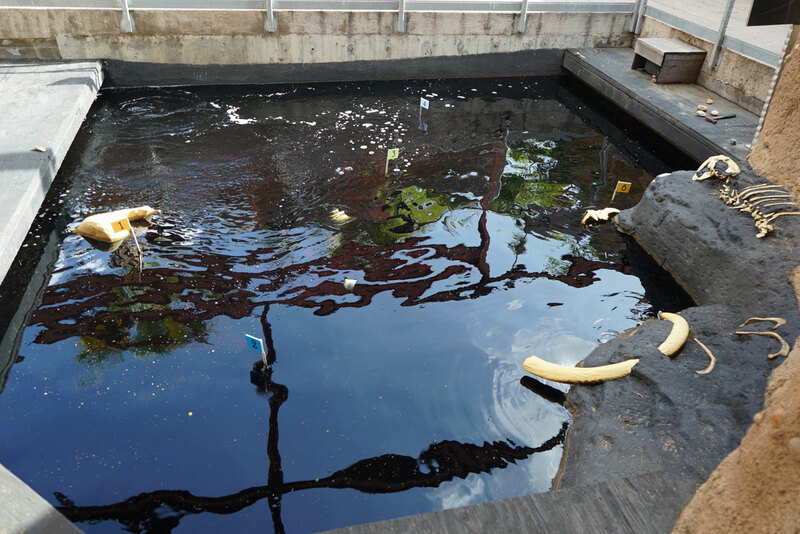 That's a neat way to illustrate what a tar pit is all about. I'm guessing that the tall dirt walls are man-made (concrete), otherwise they would erode away whenever it rains. Plus, danger of them collapsing onto the guests. 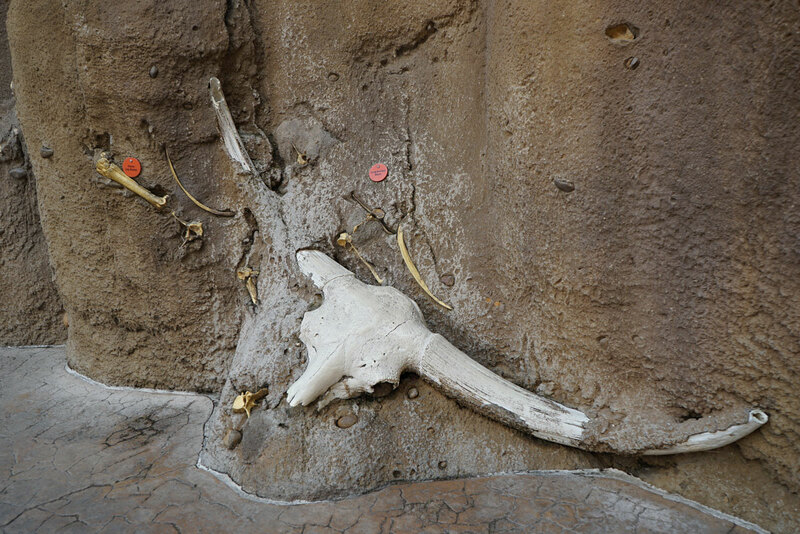 I assume the fossils in the walls are also man-made- real ones would be too tempting for souvenir hunters. Maybe #5 is that smilodon(?) fossil up on the rocks to the right of the pit.